Biofuels may play a significant role in regard to carbon emission reduction in the transportation sector. Therefore, a thermochemical process for biomass conversion into synthetic chemicals and fuels is being developed at the Karlsruhe Institute of Technology (KIT) by producing process energy to achieve a desirable high carbon dioxide reduction potential. In the bioliq process, lignocellulosic biomass is first liquefied by fast pyrolysis in distributed regional plants to produce an energy-dense intermediate suitable for economic transport over long distances. Slurries of pyrolysis condensates and char, also referred to as biosyncrude, are transported to a large central gasification and synthesis plant. The bioslurry is preheated and pumped into a pressurized entrained flow gasifier, atomized with technical oxygen, and converted at > 1,200°C to an almost tar-free, low-methane syngas. Syngas - a mixture of CO and H2 - is a well-known versatile intermediate for the selectively catalyzed production of various base chemicals or synthetic fuels. At KIT, a pilot plant has been constructed together with industrial partners to demonstrate the process chain in representative scale. The process data obtained will allow for process scale-up and reliable cost estimates. In addition, practical experience is gained. The paper describes the background, principal technical concepts, and actual development status of the bioliq process. It is considered to have the potential for worldwide application in large scale since any kind of dry biomass can be used as feedstock. Thus, a significant contribution to a sustainable future energy supply could be achieved. Only 200 years ago, the energy supply of a one billion world population depended entirely on renewables. The main energy source was firewood for residential heating, cooking, and lighting, as well as serving for high-temperature processes like iron ore reduction, burning bricks and tiles, or glass melting, etc. A complementary energy contribution was mechanical energy from hydropower for hammer mills or wind energy for windmills and sailing ships. Not to forget that the main power source for human activities carried out by working animals and human workers has been fuelled by biomass. Large energy plantations in the form of grassland and arable land (e.g., for grass, hay, oat, etc.) were devoted to 'transportation fuel' production for horses, donkeys, camels, etc. A well-established organic chemical industry based on various biomasses also existed until about a century ago. Examples are the coproducts from thermochemical charcoal production like tar and pitch, e.g., as a glue for ship construction, wood preservatives, turpentine, 'wood spirit' (methanol), or 'wood vinegar' (acetic acid), etc. or biochemical wine and beer production by sugar and starch fermentation. It took many decades of development efforts until the major organic chemicals could be manufactured by cheaper synthetic processes from coal, crude oil, or natural gas. Mid-2011, a world population of 7 billion people consumes around 13 Gtoe/a of primary energy . The world primary energy mix consists of ca. 80% fossil fuels and ca. 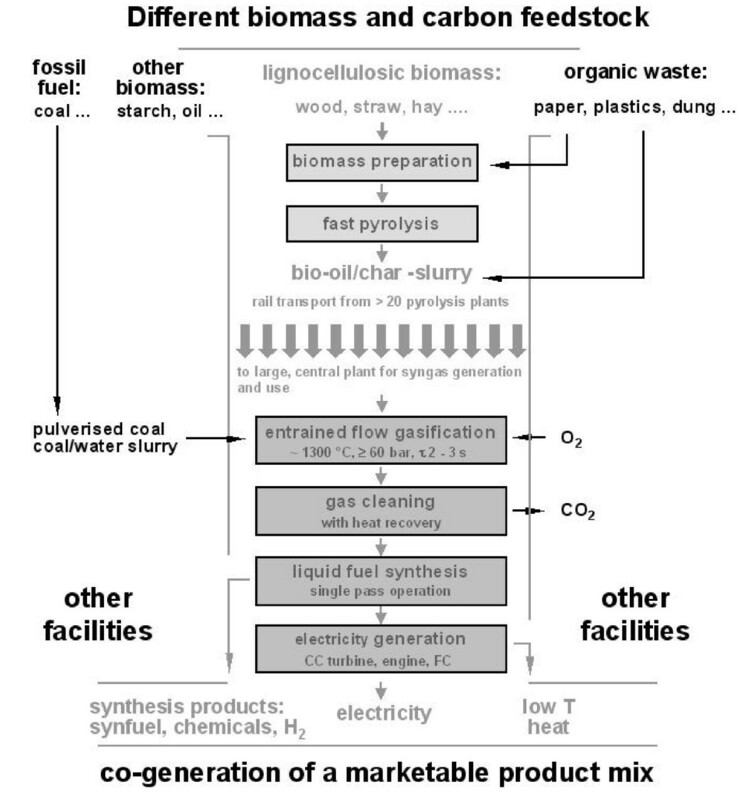 10% bioenergy as shown in Figure 1. Towards the end of the century, an increase of the world population to a maximum of almost 10 billion is expected in combination with a doubling of the energy consumption to about 25 Gtoe/a. This corresponds to an average energy consumption of 3.4 kW(th)/capita or about two-thirds of the present per capita consumption in the European Union (EU 27). The economic growth takes place in the highly populated and rapidly growing and developing nations mainly in China, India, Indonesia, the neighboring South East Asia region, and in South America, e.g., Brazil, and comprises more than half of the future world population. World primary energy mix 2010. If the high fossil fuel share of ca. 80% would be maintained in the future energy mix, the proven and economically recoverable overall coal, oil, and gas reserves of almost 2 Ttoe  known in 2010 will be depleted in about a century as a continuation of the present consumption rate: first the oil in 43 years, then the gas in 62 years, and the larger coal reserves at the end in almost 400 years. However, coal will be consumed much faster when it has to take over the large oil and gas share. Together with a doubling of the energy consumption, the realistic, dynamic lifetime shrinks to a little more than 100 years. In this scenario, the present CO2 content of 386 v/v in the atmosphere will about to double and cause global warming of several kelvin with rising sea levels and more frequent weather excursions. To gradually replace the dwindling fossil fuels in the course of this century, renewable direct (photovoltaics and solar thermal) and indirect (hydropower, wind energy, and bioenergy) solar energies and quasi-inexhaustible energy sources like nuclear breeder and fusion reactors as well as some smaller contributions from geothermal and tidal energies must therefore urgently be developed to commercial maturity. The inevitable switchover of our energy supply from the finite fossil to renewable and - from a human point of view - quasi-inexhaustible energy sources requires much financial effort, time, and innovative ideas and will heavily strain human and material resources. Development and market introduction must be achieved in due time to avoid armed conflicts in case of a shortening or breakdown of energy supply. This task belongs to the major challenges of our century. Biomass must and can contribute an indispensible and significant part to a sustainable future energy supply, but with present-day technologies, it can by no means serve all energy needs of mankind. High priority has to be given to technology research and development for the inevitable exploitation of biomass as the only renewable carbon source for organic chemicals and fuels. Bioenergy is an inevitable by-product of the increasingly important biocarbon utilization. Only about half of the 175 trillion kW(th) of solar radiation incident on the outer atmosphere of the earth arrives directly at the earth's surface, and only 0.11% of this surface energy is converted by photosynthesis to about 170 Gt/a of dry biomass (higher heating value (HHV), 5 kWh/kg), equivalent to 70 Gtoe/a of bioenergy (HHV oil, 12 kWh/kg). About 65% or 45 Gtoe are generated on land, and 35% or 25 Gtoe, in the oceans. At present, there are only speculations on how a significant fraction of the ocean biomass can be exploited, e.g., by biochemical processes in salty seawater. About 29% of the 510-million-km2 earth surface is land. Of the 148-million-km2 land surface area, almost 40% is unfertile desert (too dry), tundra (too cold), or covered with ice. The large deserts of the earth extend around the tropic at latitudes of 23° north and south and separate the fertile tropical zone from the subtropical and temperate zones. About half of the about 90-million-km2 fertile global land areas are forests; the rest of ca. 45 million km2 are farmland (ca. 15-million-km2 arable land plus grassland), savanna, and settlement area [2, 3]. The average global upgrowth on fertile land is ca. 1.2 kg of dry biomass or 6 kWh(th)/m2/year, with a large regional scatter of at least half an order of magnitude. Harvest expectations for plantations are 2 kg of dry biomass (containing ca. 1 kg of carbon) per m2 and year. Biomass combustion for electricity generation with an optimistic 45% efficiency would yield about 0.3 to 0.5 Watt(el)/m2. Commercial photovoltaic cells are almost two orders of magnitude more efficient. Yet today, photovoltaics are still more expensive than biomass cultivation and harvest plus final combustion in conventional biomass-fired power stations. Essential for optimal plant growth are suitable soils, temperatures, sufficient water, and fertilizer supply during the right time. C3-plants are typical for temperate climates and need about 400 kg of water transpiration via their leaves to generate 1 kg of dry biomass. C4-plants, typical for tropical and subtropical climates, need only about half. With the average rainfall on earth of roughly 700 mm/a and suitable temperatures and soil fertility, a maximum biomass harvest of about 2.5 kg/m2 (25 t/ha) can be expected for C3-plants in temperate climates; with C4-plants in tropical regions without winter season, up to 50 t/ha may be possible. Such optimum harvests may be obtained in energy plantations with irrigation and two harvests or more per year. The present world average harvests are only about half of the possible maximum. There is doubt if an optimum P-fertilization can still be provided in the future without ash recycle. In particular for large-scale biomass conversion plants, recovery of phosphorous and other minerals is a must. In the EU 27 with 1,160,000-km2 arable land, a part of 6.7% is already set aside  to avoid an expensive overproduction of food. If optimum agricultural technologies are applied in all EU countries, up to 20% of the arable land or even more can be set aside or used for biomass plantations. Assuming an average harvest of 20 t/a of dry biomass/ha, a total harvest of almost 0.2 Gtoe/a (containing 0.25 Gt of biocarbon) might be realized in few decades. Even without the residues from agriculture and forestry in comparable amounts, this is sufficient for a sustainable supply of both organic chemistry and aviation fuel production. Most studies estimate that the bioenergy contribution in the EU will increase to more than 10% after 2020 and to more than 20% on the longer term . In the latter case, the major part must then be supplied from energy plantations. Different from agricultural or forest residues, all direct and indirect costs of plant cultivation must then be charged to the bioenergy. The advantages of energy plantations in tropical regions are clearly visible in Table 1 from the two to three times higher hectare yields for liquid biofuels. The most abundant constituent of terrestrial plants is lignocellulose with more than 90 wt.%, the water-insoluble polymeric construction material of the cell walls. Dry lignocellulose is composed of about 50 wt.% cellulose fibers, wrapped up and protected in sheets of ca. 25 wt.% hemicellulose and ca. 25 wt.% lignin. Any large-scale biomass use must rely on this most abundant biocarbon material. Starch, sugar, oil, or protein in food crops are far less abundant, and their use as human or animal food or feed has the highest priority. It is an important issue how much of the terrestrial biomass upgrowth of ca. 45 Gtoe/a (ca. 110 Gt/a of dry biomass) is possible and desirable to harvest. Almost half of the global land biomass upgrowth consists of the annually falling leaves and needles in the forests , above all in the tropical rain forests. They can neither be collected with reasonable effort nor used since their high mineral content makes them indispensible as an on-site fertilizer. The biomass harvest is further diminished by harvest losses and residues like tree stocks, roots, plus stubble of cereals, etc. left on-site, as well as by storage losses of wet biomass via biological degradation at more than ca. 15 wt.% water content. Limits for a secure prevention of overexploitation are not reliably known. For the EU 27 with an actual gross inland energy consumption of 1.9 Gtoe/a, the bioenergy contribution of 4% is estimated to increase sustainably to almost 15% or 300 Mtoe/a of the energy consumption expected for 2030 [4, 5]. A rather optimistic potential future scenario is presented in Table 2: about a quarter of all terrestrial biomass upgrowth or 11 Mtoe/a can be harvested and used sustainably for all biocarbon and bioenergy applications. This is almost three times the present use and probably not far from a sustainable upper limit. 5. Traditional firewood combustion, etc. a1 Gtoe is ca. 2.4 t of lignocellulose free of water and ash. BTL, biomass to liquid; CHP, combined heat and power. Human and animal food production is indispensible and is the first priority. The second priority is stem wood utilization as the still dominant organic construction material (timber) as well as the production of organic raw materials like cellulose fibers from wood or cotton, caoutchouc, or extracts like flavors, drugs, dyes, etc. In the future, when the fossil hydrocarbon reserves become too expensive or exhausted, all applications utilizing biofeedstock as the only renewable carbon resource will gradually gain higher priorities. Direct biomass combustion for heat, power, and electricity generation today still enjoys high priority to fight global warming because combustion is in most cases economically more favorable than using lignocellulosic biocarbon via gasification or fermentation as the only renewable carbon raw material for organic chemicals and fuels , yet this is only an intermediate situation as long as fossil fuels are still available. All other renewable energy sources produce heat or electricity directly but no carbon. Moreover, thermochemical biomass conversions also generate energy as an inevitable couple-product in the form of reaction heat and sensible heat of the reaction products. In future biorefineries, the cogeneration of energy will be normal and used to rise high-pressure steam, power, or electricity, mainly to supply the own self-sustained process and to export any potential surplus. The amount of carbon needed for organic chemistry is only about 4% compared to the amount which would be required for global energy supply via combustion. The 2050+ scenario in Table 2 shows that even with a massive increase of biomass use, only ca. 6 Gtoe/a or about a quarter of the future global primary energy demand can be covered by biomass. Supply of the much smaller carbon fraction for organic chemistry does not cause much problem. In some cases, carbon-based energy production is difficult to replace, in particular in the transportation sector. Even if all road transport can be electrified, a significant amount of liquid hydrocarbon transportation fuel will be needed at least for aviation, probably also for ship transport and for car, bus, and truck transports in remote areas. Producing 1 Gtoe/a of biosynfuel for these special applications requires ca. 2 Gtoe/a of lignocellulose as a raw material, a significant share of the total bioenergy harvest. Carbon materials are also needed for iron ore reduction, ca. 0.5 Gtoe/a of charcoal might be a reasonable estimate toward the end of the century. In steel and glass production, as a part of the high-temperature process, heat can be supplied in the form of electricity. Corresponding electro-technologies do not exist for the present global cement production of 2.2 Gt/a or for bricks, lime, ceramics, tiles, etc. production. The traditional direct biomass combustion for home heating and cooking is assumed to continue at the present level together with some additional CHP applications. The terms wood and straw are used here only as synonyms for slow- and fast-growing lignocellulosic biomass with low (< 3 wt.%) or higher ash content, respectively. Wood without bark is a relatively clean biofuel with a typical ash content of 1 wt.% or below. Fast-growing biomass from agriculture like cereal straw, grass, hay, etc. has an ash content between 5 and 10 wt.%, rice straw even 15 to 20 wt.%. Wood ash contains much CaO, straw ash about half SiO2 with much K and Cl. These and other inorganic constituents are needed as part of the biocatalyst systems, which are responsible for a faster metabolism. Higher ash and heteroatom (e.g., N, S) contents are therefore also typical for the faster growing aquatic plants and for active animals. This is simultaneously a hint to higher fertilizer costs for plant cultivation. Potassium can reduce the ash melting point down to less than 700°C (eutectics!). Sticky ash during either combustion or gasification increases the risk of reactor slagging. Chlorine is released mainly as HCl, causing corrosion in gas cleaning facilities, poisoning catalysts, and potentially inducing the formation of toxic polychlorinated dibenzodioxins or furans due to unsuitable combustion conditions. Volatility of alkali chlorides (in particular of KCl) at temperatures above 600°C can cause deposits, plugging, and corrosion in gas cleaning systems. Ash and volatile organic carbon impurities can create problems during co-combustion or co-gasification. Fuel nitrogen in the form of proteins is partly converted to NO. High nitrogen contents are mainly converted to N2 and must be compensated by expensive N-fertilizers. Thermochemical processing is therefore not suited for protein-rich biomass (N = 16% of the protein weight) with a N content above about 3 wt.%. The elementary CHO composition of dry, ash-, and heteroatom-free lignocellulose in different biofeedstock is almost the same and well represented by C1H1.45O0.66. A reasonable sum formula with integer atom numbers is C6H(H2O)4≙C1H1.5O0.67 or C9H(H2O)6≙C1H1.44O0.67. An even simpler and still reasonable sum formula is C3(H2O)2≙C1H1.33O0.67, a 1:1 formal mix of carbon and water in weight. The HHV of dry, ash-free lignocellulose is ca. 20% higher than a simple 1:1 wt.% carbon/water mix. However, this simple picture is useful for quick stoichiometric estimates. In comparison to glucose, as the primary organic product of photosynthesis, the sum formula C6H8O4 is also used. To represent real biomass, some ash and moisture must be added to the lignocellulose. Heteroatoms like N or S can, in most cases, be neglected to a first approximation, except in protein-rich biomass (nitrogen in protein, ca. 16 wt.%). The sulfur content usually is rather low, about an order of magnitude compared to coal. Biomass utilization will increase in the future not only due to the growing food consumption for a larger population, but also due to the extension of old and new bioenergies and especially biocarbon applications, required to gradually substitute fossil carbon and hydrogen. Our technology selection criteria for biomass refining processes have been based on general and global considerations , not on regional particularities. Bioenergy generation at the expense of poor food supply must be strictly prevented. Direct use of biomaterials with complex chemical and physical structures like wood as construction material, cotton, caoutchouc, etc. has also a higher priority than combustion. Use of biomass as the only renewable carbon resource for valuable organic materials, chemicals, and fuels has a higher priority than the generation of bioenergy via combustion. At present, the most urgent task is the development of biomass conversion technologies for liquid transportation fuels to decrease our oil dependency. Supply security is the most important aspect on the short term. Politically motivated brief shortages of oil supply or extremely high prices of crude oil can cause a serious breakdown of the world economy with a risk of armed conflicts. Biorefineries are an inevitable long-term development task for the production of all types of carbon materials from biomass. Biomass conversion to organic chemicals or to liquid transportation fuels requires several chemical reactions in succession. Energy is an inevitable couple and side product. In comparison to zero feed cost, biomass-to-liquid (BTL) processes require more technical effort than in an oil refinery. This results in a lower overall energy recovery in the final product and higher manufacturing costs. Biocarbon supply is limited. A secure and sustainable upper supply limit for biomass is not reliably known. An optimistic upper limit estimate after 2050 assumes that about a quarter of all land biomass can be exploited for everything from food to combustion (see Table 2). The present global bioenergy contribution of > 1 Gtoe/a can probably be increased sustainably to ca. 5 to 6 Gtoe/a, a factor of ca. 5. When bioenergy consumption approaches this upper limit, not only the biomass prices will increase, but also the food prices due to the mutually competitive land use. Because of the unknown bio-production limits, there is a high risk of overexploitation with a potential breakdown of bio-production for decades or centuries, as already experienced with deforestation in some Mediterranean regions. ○ For iron ore reduction, generation of either charcoal or CO or (CO + H2) mixtures via pyrolysis is a renewed old technology. ○ Heat generation for high-temperature processes for cement, bricks, lime, etc. production. ○ Conventional biomass combustion for residential heating and cooking is assumed to continue at about the present level and is probably complemented by additional CHP-plants for simultaneous heat and electricity generation in remote areas. ○ In a few decades, road or car electrification will probably complement the electrified rail. However, the convenient liquid hydrocarbons are hard to replace as aviation fuels - eventually also as ship fuels and for the still remaining fraction of car, truck, and bus fuels. In the course of the century, the biomass demand for these conventional and new synthetic transportation fuels, tailored for new or optimized engine types, might probably become higher than that for organic chemicals. The production technology for biosynfuels and organic chemicals do not differ principally. However, liquid organic fuels belong to the cheapest organic chemicals. Bioenergy can sustainably cover probably up to a quarter of the future global primary energy demand. The crude estimate in Table 2 indicates a maximum bioenergy contribution of ca. 6 Gtoe/a including the couple-product energy from chemical conversions. During thermochemical biocarbon conversion, about half of the initial bioenergy on the average is typically liberated in exothermal reactions in the forms of reaction energy and sensible heat. Recovery and conversion of half of this energy, e.g., in high-pressure steam or electricity, make use of about a quarter of the initial bioenergy as a couple-product. Physicochemical - e.g., pulp and paper mills, sugar mills, corn mills, fatty acid methyl ester plants, etc. Thermochemical - high-temperature dry processes proceed usually via syngas, e.g., BTL technology. Additional classification aspects - without considering educts and products - are the main intermediate(s) (platform chemicals), which are suited for mutual exchange between plants. This script reports about a development work for the 'backbone' conversion steps of a thermochemical biorefinery: conversion of the abundant lignocellulose via biosyngas - a mix of CO and H2 - as a versatile intermediate to H2, CH4, CH3OH [10, 11], dimethyl ether (DME), Fischer-Tropsch (FT) hydrocarbons,  or other carbon products, using highly selective catalysts at specified temperatures and higher pressures. Most synthesis steps are known since almost a century and are practiced already on the technical scale [13, 14] based on coal and natural gas as feedstock known as coal-to-liquid (CTL) and gas-to-liquid (GTL) processes. Examples are the CTL plants operated by Sasol in South Africa or the Shell GTL plants in Malaysia or Qatar. The development of BTL is not completed but, to a large extent, can rely on the old coal conversion technologies in an improved or modified form. Major development work is needed especially for the front-end steps to prepare a clean syngas from various biofeedstock types. After generation of a clean syngas with the desired H2/CO ratio, the BTL technology is comparable with the practiced CTL and GTL technologies since it does not make a difference if the syngas has been produced from coal, oil, natural gas, biomass, or organic waste. Syngas or C1 chemistry in general is based on a well-known technology [13, 15]. This is why the actual work at the Karlsruhe Institute of Technology (KIT) has been focused mainly on the front-end BTL steps. 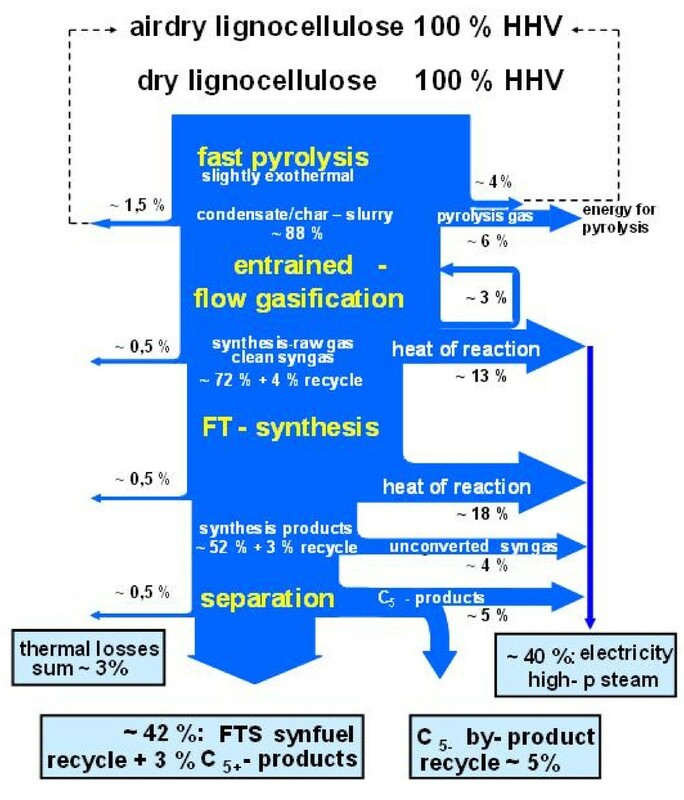 The typical gasifier types  for coal shown in Figure 2 can also be used for lignocellulosic biomass after special preparation . Suitable feed particle size and gasification reaction times decrease from about 0.1 m and more than 103 s for fixed bed gasifiers, via ca. 1 cm and 102 to 103 s for fluidized bed gasifiers, down to ≤ 0.1-mm fuel powders, which react in one or few seconds in an entrained flow (EF) gasifier flame. Short reactor residence times and higher pressures result in smaller and more economic reactors with a higher throughput. Gasifier types suited for coal and biomass. Fixed and fluidized bed gasifiers operate with solid ash at temperatures below 1,000°C. 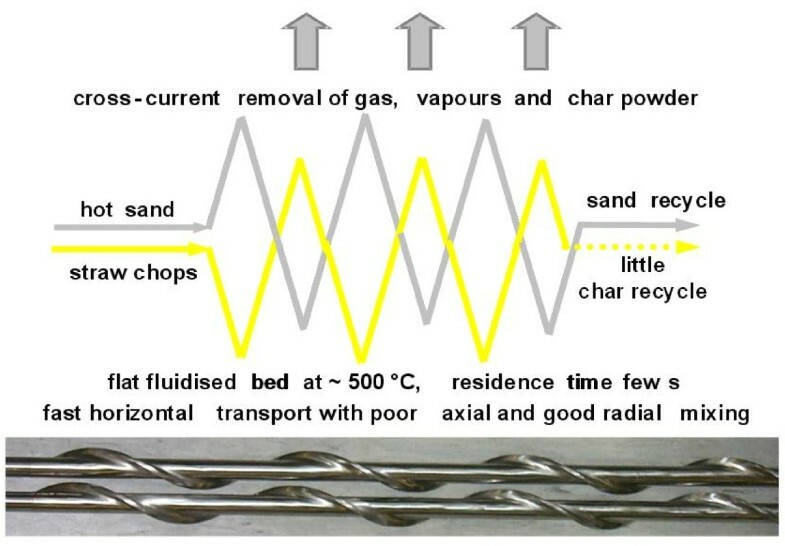 Low-melting straw ash can become sticky already at 700°C and can create problems by bed agglomeration. Raw syngas from fixed and fluidized beds contains tar and methane because of the low gasification temperatures; especially, the syngas from updraft gasifiers is contaminated with much dirty pyrolysis gas. Syngas applications for combustion can tolerate high methane contents and require less gas cleaning efforts. EF gasifiers operate above the ash melting point at > 1,000°C and generate a practically tar-free, low-methane raw syngas. Because of the higher temperatures in an EF gasifier, a cleaner syngas is obtained at the expense of more oxygen or air consumption and correspondingly lower cold gas efficiency. However, this is at least partly compensated for by the low methane content, which would otherwise reduce the CO + H2 syngas yield by 4% for every percent of CH4: CO+3H2⇄CH4+H2O. Synthesis reactions with syngas are exothermal and generate larger molecules, except the CO-shift reaction to H2. Equilibrium yields and kinetics are therefore improved by higher pressures, usually in the range of 10 to 100 bar. Slagging EF gasifiers can be designed for higher pressures up to 100 bar and allow for higher and more economic capacities up to 1 GW(th) or more. Another contribution to synthesis economy is the use of pure oxygen as a gasification agent to avoid syngas dilution to about half with N2 from air. High feed flexibility; according to the high conversion temperatures, the gasifier is a 'guzzler.' With a modified burner head biooils, bioslurries and biochar powder can be gasified. Precondition for EF gasification is the conversion of a solid feedstock to a gas, liquid, slurry, or paste, which can easily be transferred by a compressor or pump into the pressurized gasifier chamber. Any organic feed stream with a HHV > 10 MJ/kg, which can be pumped and atomized in a special nozzle with pressurized oxygen as gasification and atomization agent, is suitable. At moderate pressures, a dense stream of fine char or coal powders can also be fed pneumatically from a pressurized fluid bed with an inert gas stream , similar to pulverized, coal-fired burners in power stations. At increased pressures, the powder transport density remains nearly the same, and more transport gas is required. At a sufficiently high gasification temperature, slag with oil- or honey-like viscosity drains down at the inner wall, drops into a water bath below the gasification chamber for cooling, and is removed periodically via a lock. The large volume flow of hot syngas through the lower central opening of the membrane screen vessel causes a certain pressure drop, which is measured. A higher pressure drop indicates a narrowing of the exit hole by highly viscous slag. This automatically increases the oxygen flow and thus the gasifier temperature until the slag is molten and drained. Additives or slag recycle can be helpful to maintain a sufficiently low slag melting temperature and thus to limit oxygen consumption at a still sufficiently high gasification rate. The membrane wall with SiC refractory permits the gasification of fuels with much ash and corrosive salts, as is typical for straw and straw-like, fast-growing biomass. The relatively thin membrane wall plus slag layer has a low heat capacity and allows frequent and fast start-up and sudden shutdown procedures without damaging the gasifier, e.g., in case of an accidental feed interruption. The membrane wall design with protecting slag layer guarantees long service life for many years, as has been shown in more than 20 years of operation with various feeds in the 130-MW(th) GSP gasifier at 'Schwarze Pumpe', East Germany [29, 30]. A disadvantage is the high heat loss of 100 to 200 kW/m2 through the thin slag and SiC layer at the membrane wall, depending on the thickness and composition of the slag layer. In small pilot gasifiers with only few megawatt power, the large surface-to-volume ratio causes a considerable heat loss of several 10% and requires careful data correction for scale-up considerations. In large commercial gasifiers with a capacity of several 100 MW(th), the losses via the membrane screen drop to below 1% and become negligible. This shows that the GSP gasifier is not recommendable for small-scale plants. The GSP-type (gasification complex 'black pump') has been developed in the 1970s in the Deutsches Brennstoff Institut (DBI), Freiberg, East Germany, for the salt (NaCl)-containing lignite from Central Germany, which poses corrosion problems with alkali chlorides similar to KCl-containing slag from fast-growing biomass [29, 31–33]. Figure 3 shows the simplified GSP gasifier design. The internal cooling screen is a gastight, welded membrane wall of cooling pipes with a thin inner SiC liner, particularly suited for low-quality biomass with much low melting slag from KCl-containing ash. The pipes are cooled with pressurized water at 200°C to 300°C. A thin, ca. centimeter-thick, viscous slag layer covers and protects the inner surface of the membrane wall from corrosion and erosion. Only a small slag fraction of a few percent escapes in the form of tiny, sticky droplets with the raw syngas. In 1996, an experienced development personnel designed and built an improved 3- to 5-MW(th) GSP pilot gasifier in Freiberg to test the hazardous waste conversion process of Noell Company . Experience with the GSP gasifier is the sound basis of the KIT concept. 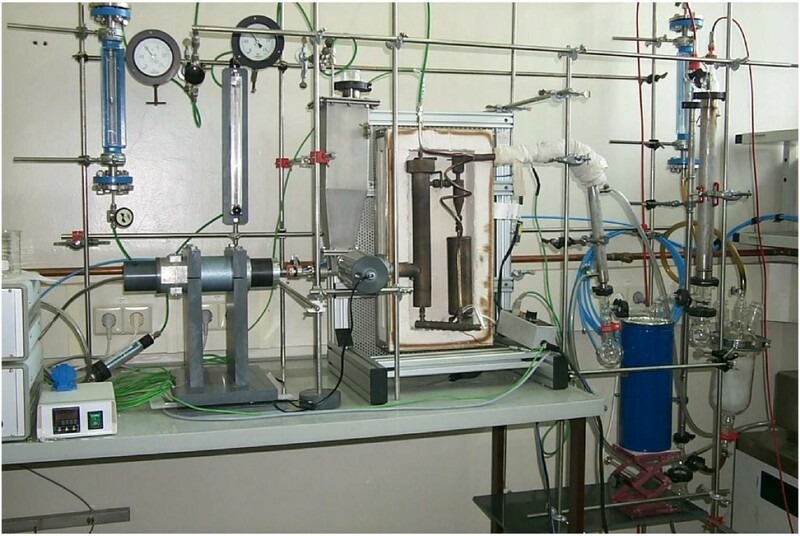 The KIT bioslurry gasification concept has been verified and investigated in this pilot gasifier in four gasification campaigns in year 2002, 2003, 2004, and 2005 in cooperation with Future Energy, today Siemens Fuel Gasification Technologies. 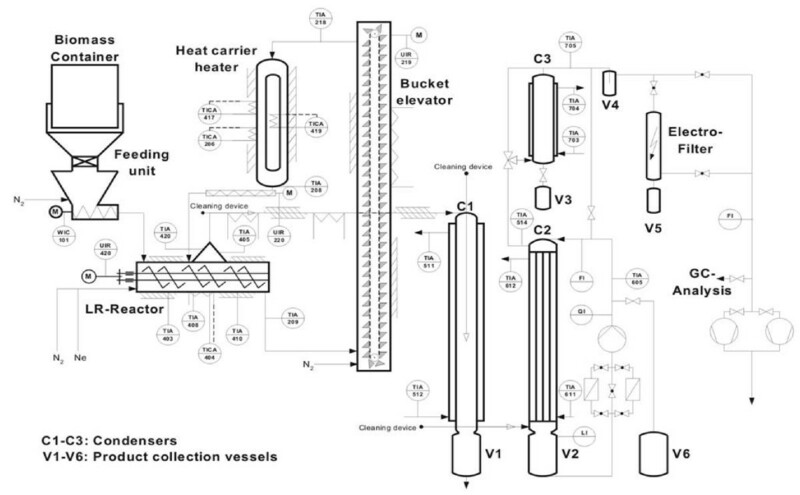 Scheme of a PEF gasifier with cooling screen. At KIT, a 5-MW(th) pilot gasifier with a cooled membrane wall for a maximum of 80-bar pressure is presently being constructed as a part of the bioliq pilot facility for the production of synthetic biofuels from biomass. Substantial financial support has been granted by FNR (German Ministry of Agriculture). Responsible for the design, erection, and commissioning of the PEF pilot gasifier with a membrane wall is Lurgi AG Company, Frankfurt; start-up is expected in 2012. Several companies have recognized the advantages of slagging PEF gasifiers for biomass conversion to syngas; Table 3 gives a brief overview. The main difference between these process variants are the biomass pretreatment steps. Pretreatment for PEF gasifiers requires more technical effort than that for fixed or fluidized bed gasifiers. KIT, Karlsruhe Institute of Technology; GSP, Gaskombinat Schwarze Pumpe; FP, fast pyrolysis. The bioslurry-based BTL process of KIT called bioliq is described in more detail in the works of Henrich and colleagues [18–27]. The simplified process scheme in Figure 4 gives an overview. Block flow diagram of the bioliq ® process. Sufficiently dry lignocellulosic biomass like wood or straw below ca. 15 wt.% moisture can be stored without biological degradation. The dry biomaterials are diminuted in two steps into small particles of < 3 mm in size. The energy required for diminution is reduced at lower moisture. Biomass particles with a characteristic length of < 0.5 mm (sphere diameter, < 3 mm; cylinders, < 2 mm; plates, < 1 mm) which are equivalent to a specific surface of > 2,000-m2/m3 biomass volume are mixed at atmospheric pressure and at temperatures of ca. 500°C under exclusion of air with an excess of a hot, grainy heat carrier like sand or stainless steel (SS) balls [27, 35]. In principle, any fast pyrolysis (FP) reactor type  can be applied. At KIT, an FP system with a twin-screw mixer reactor is being developed, based on the Lurgi-Ruhrgas system. The thermal decomposition of biomass and the condensation of organic tar vapors and reaction water vapors take place in the course of one or few seconds. High condensate yields of 45 to 75 wt.% are coupled with low char and gas yields; this is typical for FP. The char contains all ash; the solids' yield depends on feedstock and operating conditions and is in the range between ca. 10 and 35 wt.%. The pyrolysis gases contain CO and CO2 as main components in amounts between 30 and 55 vol.%; methane, hydrogen, and hydrocarbons up to C5 amount to ca. 10 vol.%. The heating value of the pyrolysis gas is about 9 MJ/kg. The total energy content of the FP gas corresponds to about 10% of the initial biomass HHV and is sufficient to supply the thermal energy for a well-designed FP reactor. FP char contains about 20% to 40% of the initial bioenergy; the condensate (biooil), 70% to 50%, and together, about 90%. If only the biooil is used for gasification without the char, about one-third of the bioenergy would not be accessible for syngas generation. Therefore, the pyrolysis char powder is mixed into the biooil to generate a dense slurry or paste with a density of about 1,200 kg/m3 and a HHV from 18 to 25 GJ/m3 which corresponds to one-half up to two-thirds of the volumetric energy density of heating oil (HHV 36 GJ/m3) [37–39]. There are many good reasons for bioslurry production: A single pyrolysis product with high energy density eases handling, storage, and transport; a free-flowing bioslurry can be conveniently pumped with little effort into highly pressurized gasifiers. Even low-quality biooils which are prone to phase separation and are contaminated with char and ash are still suited for bioslurry or paste preparation. The fine, porous pyrolysis char powders from FP are very sensitive to self-ignition (self-ignition temperature is typically > 115°C), and fine, airborne, char dust particles can penetrate breathing masks. Pulverized biochar usually is pelletized for safety and handling reasons; slurries provide a much safer way of char handling. Not only bioslurries and pastes, but also other dense forms like char crumbs soaked with tar or pelletized biochar can be transported in silo wagons with the electrified rail from several dozens of regional pyrolysis plants into a large, central biosynfuel plant for syngas generation and use. PEF gasification is a complex technology, and a large scale is required due to economy-of-scale reasons. A suitable menu of bioslurries is preheated with waste heat from the process to reduce the viscosity and mixed in large vessels to obtain the desired composition and is then further homogenized in robust colloid mixers  during feeding. The preheated slurry is transferred with screw or plunger pumps into a highly pressurized PEF gasifier and pneumatically atomized in a special nozzle system with pure oxygen. Gasification to a tar-free, low-methane syngas proceeds in 3 to 4 s in a downward flame  at ≥ 1,200°C above the ash melting point and at pressures up to 100 bar. In a GSP-type gasifier , a viscous, honey-like, ca. 1-cm-thick slag layer drains down at the inner surface of a cooled membrane wall and protects the gasifier from erosion and corrosion. Gasifier compatibility with the corrosive biomass ashes is an essential characteristic. The high pressure slightly above the downstream syntheses pressure eliminates the high investment and operating costs for an intermediate syngas compressor station and reduces the PEF reactor size. The pilot gasifier currently erected at KIT can be operated at pressures up to 80 bar. Syngas is a 'platform chemical' which can be used for many different purposes: (1) combustion for a high-temperature process of heat generation, (2) as fuel gas in IGCC power stations, or (3) in small CHP plants with stationary gas motors or turbines. Moderate gas cleaning is required for these applications. Practically, no syngas cleaning is needed for iron ore reduction. A very efficient raw syngas cleaning and conditioning section is needed prior to a catalyzed chemical synthesis . Slag and soot particles, tars, alkali salts, and gaseous S-, N-, and Cl-containing impurities like H2S, COS, CS2, NH3, HCN, HCl, etc. have to be removed down to below the part-per-million level to prevent poisoning of the highly selective but sensitive catalysts. The lower the catalyst temperature, the higher the selectivity, but the sensitivity to impurities is also a rule of thumb. Conventional technologies for gas cleaning are available, e.g., the well-established Rectisol process with methanol. Most syngas reactions require an optimum H2/CO ratio, which is usually obtained via CO conversion to H2 with the catalyzed homogeneous shift reaction CO + H2O ⇄ CO2 + H2; a Fe/Cr catalyst is applied for the high-temperature shift at ca. 400°C, and a Cu/Zn catalyst is applied for the low-temperature shift at ca. 200°C; a sulfur-resistant MoS2/Co catalyst is suited at ca. 300°C. CO2 removal downstream is possible with a number of absorbers; the conventional Rectisol process  removes all higher boiling impurities by absorption in cold methanol at ca. -50°C; this is a well-known and very efficient but expensive technology, yet one of our objectives is to look for process variants without the necessity of an expensive CO shift. In addition, in the pilot facility of the bioliq process, a hot gas cleaning system is applied, consisting of a ceramic particle filter, a fixed bed sorption for sour gas and alkaline removal, and a catalytic reactor for the decomposition of organic (if formed) and sulfur- and nitrogen-containing compounds . Clean syngas with the desired H2/CO ratio, temperature, and pressure is routed to one of the highly selective catalysts for the production of H2, CH4, methanol (CH3OH), DME, CH3OCH3, olefins, alcohols, FT hydrocarbons, or other chemicals [43, 44]. Synthesis selectivity permits a flexible switch-over into different routes of organic chemistry. Except H2 production via the CO-shift reaction, the synthesis of larger molecules proceeds under volume reduction, and higher pressures favor product formation at equilibrium. Because of the order increase in the product molecules, the reaction entropy ΔrS is negative, and lower temperatures shift the equilibrium to the product side. At lower temperatures, more active catalysts are needed, which are more sensitive to trace impurities and require more efficient gas cleaning; also, a conversion of the reaction heat to power and electricity becomes less efficient. Most synthesis reactions with syngas are highly exothermal, and efficient heat removal is the main problem of the reactor design. The major reactor types are tubular, staged, or slurry reactors with efficient coolers. The immense literature on catalytic syngas conversion is summarized in reviews [13, 15], monographs , and handbooks . Reasonable pathways to biosynfuels are the FT synthesis and the methanol route [10, 13, 45]. The FT product spectrum depends on the temperature (200°C to 350°C), pressure (15 to 40 bar), reactor type, and catalyst, usually Fe or Co, and extends from gaseous CH4 and C2-C5 alkanes, a C5-C9 gasoline, and a C10-C20 diesel fraction of n-alkanes up to linear C100 waxes. Fe catalysts catalyze also the CO-shift reaction and allow operation with H2/CO ratios below 2 in the feed gas. To increase the biosynfuel yield, the C25+ product waxes are catalytically converted into gasoline and diesel in a hydrocracker. Present focus of the bioliq process is the production of gasoline via DME (boiling point (b.p.) 24°C) [46–48] as a chemical intermediate to organic chemicals and biosynfuels. Neat DME is suited as a clean and environmentally compatible diesel fuel for cold climates. For the one-step synthesis of DME in the bioliq process, a mixture of a low-temperature Cu/ZnO/Al2O3 methanol catalyst and an alumina or zeolite dehydration catalyst is used. Since the methanol catalyst also catalyzes the CO-shift reaction, a lower H2/CO ratio of 1 or even below offers the possibility of a cheaper syngas purification train without CO shift. In addition, the high, thermodynamic DME yields at higher pressure offer the possibility of a single-pass synthesis without expensive recycle of unreacted syngas. The FP plant is already in operation; the other three plants are under construction with start-up expected in 2012. In the years to come, the present focus on biosynfuel will gradually shift to chemical products. The status of the KIT bioliq pilot plant is reported elsewhere [49, 50]. A photo of the construction site is shown in Figure 5. The bioliq ® pilot plant construction site. The following chapters explain the conceptual design and process fundamentals in essential details and the research and development status for the KIT bioliq process in sequence of the successive process steps. Finally, a cost estimate is presented. Any type of dry lignocellulosic biomass can be exploited with the bioliq process. The present experimental program at KIT focuses on low-quality lignocellulosic biomass, which is rarely used and still available in larger amounts in central Europe. This amounts to about half of the cereal straw harvest which is not used and not needed to maintain soil fertility. As a crude overall estimate, it can be assumed that the average grain-to-straw ratio is about 1. The world grain harvest (wheat, maize, rice, and barley together ca. 90%) amounts to 2.2 Gt/a, and thus, about 1.1 Gt/a of surplus straw will be available, a significant energy equivalent of 0.4 Gtoe/a. Residues from the logwood (timber) harvest like bark, twigs, and other forest residues can contribute a comparable amount. The cost for cultivation and harvest of these bio-residues is covered by the main products. We have checked the conventional drying, diminution, and heating processes for various biomaterials. Drying to less than 15 wt.% water content is desirable to prevent biological degradation during storage. Up to now, we have focused on a two-stage diminution of air-dry straw: first in a usual chaff cutter followed by a hammer mill to smash the several-millimeter-thick stalk nodes. Nodes come to about 5% of the straw mass and increase the heat-up time and reactor size for FP with the square of the particle size. The typical wall thickness of cereal straw is about 0.3 mm and corresponds to a specific surface of almost 7,000 m2/m3. The reciprocal specific surface is the shape-independent characteristic length of 0.15 mm. Diminution to a single-walled straw material down to about 1 cm in length is sufficient; further diminution is not desirable because it does not change the characteristic lengths, and excessive diminution creates dust problems. We also operate a shredder for the first diminution of large pieces and a cutting mill for the second stage. The latter turned out to be suited even with dump knives. A hammer mill is also suited for the final diminution of wood chips to below 3 mm. Due to the large variety of biomaterials, there is no standard solution for optimum diminution. Drying increases the brittleness and reduces the energy consumption for diminution. After the first oil price crisis in 1973, the development of FP of lignocellulosic biomass was pushed mainly in Canada, where huge forest resources and a low population density create a high mass potential. Conversion of wood in a simple, single step at a moderate temperature of about 500°C into a stable and clean liquid fuel called biooil was a charming idea [51, 52]. The vision was to replace part of the crude oil-derived heating oil and to substitute a substantial part of the oil-derived motor fuels not only for stationary applications, but hopefully also for mobile internal combustion engines in passenger cars, busses, and trucks. Today, three decades later, no commercial biomass FP plant is in operation for 'biooil' motor fuel production. On the contrary, most of the FP pilot plants which have been designed, built, and operated for some time have been decommissioned or mothballed. Reported reasons are low oil prices, high biomass prices, poor biooil qualities in view to impurities, low chemical biooil stability, and phase separation. Additional technical reasons are poor plant reliabilities and availabilities. Most FP investigations reported in the literature have been conducted with 'white' wood without bark . Relatively homogeneous and reasonably clean and stable, single-phase biooils have been obtained from wood. From ash-rich lignocellulosic materials like cereal straw and other grassy biomass, we have obtained a lower biooil quality and yield with higher water content, which results in immediate or delayed phase separation into a heavier tar phase and a lighter aqueous phase . In practice, two different condensates are obtained by a two-step condensation: First, a tar condensate at about 100°C with a few percent of water, which can solidify already at temperatures much above ambient. At about ambient temperature, an aqueous condensate is obtained with ca. 70 ± 15% water and various dissolved organics and has a lower heating value (LHV) of usually less than 5 MJ/kg . Biooils with two phases are unsuited for higher combustion applications: Biooil contamination with pyrolysis char particles is another problem because all ash is contained in the char. Removal of the fine char particles by filtration fails by filter plugging and centrifugation by insufficient density differences. Compared to combustion, biooil quality requirements for PEF gasification in a GSP-type gasifier are much lower. At least ca. 1 wt.% ash is even needed to generate a protective slag layer at the inner surface of the gasification chamber. Poor pyrolysis condensates with much char and ash are therefore still suited for bioslurry preparation and subsequent gasification. The pyrolysis char increases the energy content of the biooil considerably by 30% to 80%. Poor-quality lignocellulosics, e.g., ash-rich agricultural residues like cereal straw, are still available as an almost unused biocarbon resource. They can now be tapped and contribute substantially to the global biocarbon potential. The lower quality requirements connected with a change of biooil application from combustion to gasification can help to simplify the FP process. FP of biomass can also be designed as an independent process for the recovery of valuable pyrolysis products without integration into a biosynfuel production. Potential applications and recovery procedures for particular pyrolysis products are reported in the literature . Commercial applications are the production of food flavorings (liquid smoke) and other fine chemicals as practiced, e.g., by Ensyn Company. A removal of a few mass percent biooil constituents is not expected to jeopardize bioslurry production for subsequent gasification. An assumed profit of only €3/kg for 3 wt.% of recovered valuable biooil constituents might cover already all technical bioslurry manufacturing costs of ca. €50/t (see also the 'Economic aspects' section). It is likely that such opportunities are developed and commercially applied in the future. A speculative extrapolation into an extended and established biorefinery future involves an annual biooil production globally in a gigaton range. Removal of minor constituents of a few percent in weight extends already into the ≥ 10-Mt/a production range and can create a significant contribution to the supply of organic specialty chemicals. Various reactor types are being investigated for FP of biomass since about three decades [36, 55] without a clear champion; they are depicted in Figure 6. Most types use an excess of a hot, grainy heat carrier - usually 1-mm quartz sand - heated to about 550°C, which is quickly mixed with the dry (≤ 15% water) biomass, diminuted to less than 3-mm grain size. FP takes place in about 1 s, and the pyrolysis product gas, condensable vapors, and small char particles are expelled from the heat carrier bed in about 1 s. The heat carrier grains are cooled down by ΔT = 10 to 100 K to a final temperature of about 500°C and are then recycled and reheated in a closed loop. The bulk of the fine pyrolysis char particles is carried with the hot pyrolysis gases and vapors and is removed directly at the reactor exit in a hot cyclone operated at the FP reactor temperature of 500°C. A minor char fraction is retained in the heat carrier loop. With a well-designed and well-operated pyrolysis reactor, char accumulation in the heat carrier loop remains at an acceptably low level. Downstream from the cyclone, the pyrolysis gases and vapors are usually quenched to about ambient temperature by the injection of a large stream of cooled condensate through nozzles. Rapid quench cooling in a few seconds is essential to prevent significant pyrolysis vapor decomposition and maintains a high condensate yield. Quenching techniques avoid the fouling of heat exchanger walls with tar deposits. The disadvantage is that quench condensation does not allow efficient heat recovery. 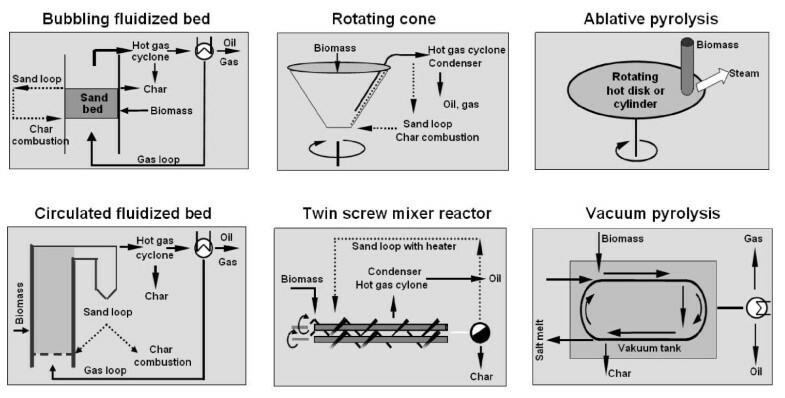 Reactor types used for fast pyrolysis of biomass. The most common reactor type is a bubbling fluidized bed with ca. 1-mm quartz sand [36, 55]. Cold pyrolysis gas downstream from the quench condenser must be recycled for bed fluidization. Pyrolysis vapor dilution with non-condensable gases increases the undesired energy loss during quench condensation and requires a larger and more expensive condensation system. 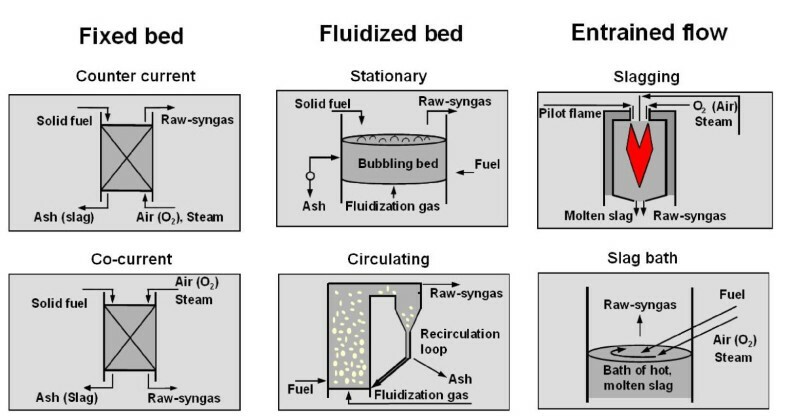 A circulating fluidized bed requires even more fluidizing gas. Ensyn Company successfully operates such 2-t/h FP reactors since many years on a commercial scale, but different to optimum syngas generation, the energy efficiency is not an important aspect for their production of fine chemicals and food flavorings. The rotating cone reactor [56, 57] and the twin-screw mixer reactor  use a hot heat carrier loop with a mechanically fluidized bed without an auxiliary fluidizing gas. This reduces the size of the biooil condensation system, but especially somewhat higher flow fluctuations and reduced char removal efficiency in the cyclone must be considered. Vacuum operation at ca. 0.1 to 0.2 bar is another more general method , which can be applied in all process versions to reduce the gas and vapor residence time. However, technology becomes more complex, and control of air in leakage is an additional safety aspect, which usually is prevented by a slight overpressure. Pyrovac Company, Canada has discontinued pilot plant operation because of financial problems. The state of development of ablative pyrolysis is relatively low, especially in view to scale-up . The ceramic ball-heated downflow tube reactor, developed at Shandong University of Technology, China, deserves attention because of its simple design and operation . The twin-screw mixer (TSM) reactor was chosen because it was already applied on a technical scale for FP of other materials like coal, oil refinery residues, or oil shale . Technology development started in the 1950s with a collaboration of Lurgi and Ruhrgas Companies for the so-called Lurgi-Ruhrgas (LR)-mixer reactor for coal pyrolysis for town gas production . If the TSM reactor turns out to be suited also for FP of biomass, it is expected that the available industrial experience will contribute to reduce time and cost of further development to a commercial scale. This practical aspect does not necessarily mean that design and operating principles of the TSM are superior to the other FP reactors. Any type shown in Figure 6 is principally suited to prepare a bioslurry for PEF gasification. Also, the pyrolysis product yield structure is not expected to be much different. Final selection criteria will be based on costs, safety, reliability, and plant availability, which depend much on the FP reactor periphery. Design characteristics of the TSM reactor are two intertwining and specially shaped screws, rotating in the same sense and cleaning each other as well as the internal reactor surfaces. Design and operating principles are outlined in Figure 7. The grainy material is transported axially and mixed radially. A suitable rotation frequency ν is at a Froude number of 1. This means that the centrifugal force 2π2·m·dν2 at the outer screw radius equals the weight m·g. This creates fluidization, which considerably eases transport and mixing. The level in the reactor increases in proportion with the throughput and is usually kept at less than half to prevent plugging. Principle of the twin-screw mixer reactor. At typical residence times in the order of about 10 s, the reactor surface is too small to supply the heat for pyrolysis through the wall. A surplus of a hot, grainy heat carrier material, e.g., quartz or SiC sand, ceramic grains, or SS balls, is therefore quickly mixed with the cold diminuted biofeed. To ensure a rapid pyrolytic decomposition, the particle size of heat carrier and biofeed must be small enough to expose a sufficiently large surface for heat transfer. A desirable heat carrier/feed ratio on a volume basis is about 2; this means that the empty space between the heat carrier grains of about 40% of the total bed volume is filled with the bulky diminuted biofeed. Since the biomass volume shrinks to about half during pyrolysis, about equal bulk volumes are a reasonable maximum at start. With a bulk density of 4,800 kg/m3 for steel balls and 100 kg/m3 for un-pyrolyzed straw chops, about 50 kg of steel balls will be circulated per kilogram of biomass. This is the design ratio in our FP-process development unit (PDU). All pyrolysis gases, vapors, and fine char particles are expelled in a cross-flow direction from the shallow reaction bed. Rapid removal and quench condensation of the pyrolysis vapors is essential to prevent thermal vapor decomposition at the surfaces of the hot heat carrier grains and maintains high condensate yields. For quick screening tests of the FP behavior of various biomaterials, a lab-scale device with a bubbling fluidized sand bed for a maximum of 0.3 kg/h of throughput has been built (Figure 8). The reactor is 4 cm in diameter and is filled 12 cm high with ca. 0.2-kg, 0.2- to 0.3-mm-diameter quartz sand and fluidized with 1 m3(standard temperature and pressure (STP))/h preheated nitrogen. A pre-weight amount of ca. 0.5 kg of diminuted biomass is constantly fed into the fluidized bed with a screw feeder together with a slight nitrogen stream to prevent backflow of pyrolysis gas. The pyrolysis reactor and the subsequent char cyclone are mounted in an electrically heated oven. Product recovery is conventional via a hot cyclone and a two-stage condenser with an electrostatic precipitator. At the end, the mass of char, condensate, and gas is determined and analyzed. 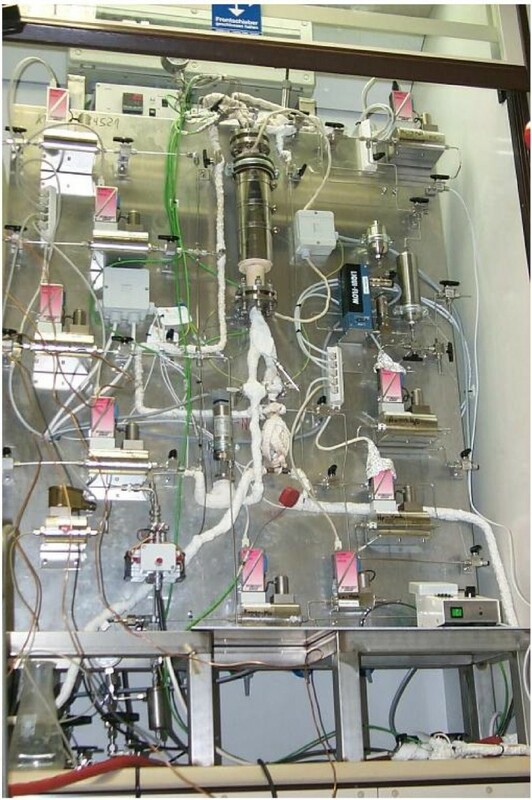 In 2002 to 2003, a PDU with a TSM reactor for a throughput of 10 to 20 kg/h of biomass has been designed and built at the KIT to test the suitability of the twin-screw reactor type for FP of biomass . A simplified flow sheet is shown in Figure 9. The major plant sections are briefly described. Flow sheet of the FP PDU. Hot heat carrier loop. A grainy heat carrier circulates at a temperature of about 500°C in a closed, gastight loop with a single exit for all pyrolysis products. Various heat carriers either 1-mm sand or SiC grains or 1.5-mm SS balls are lifted vertically 3 m with a conventional bucket elevator made from SS. The heat carrier material is reheated by ΔT = 10°C to 100°C during gravity flow through a 1-m-high, coaxial twin cylinder with a diameter of 0.15 m and a 1-cm-wide annular gap, heated electrically from both sides via a 1-m2 surface. A volume-calibrated, controlled screw feeder transports a constant heat carrier stream into the pyrolysis reactor, at a maximum of either 0.4-t/h, 1-mm quartz (bulk density 1,500 kg/m3) or SiC sand or 1.5- to 2-mm SS balls up to 1.5 t/h (bulk density 4,800 kg/m3). A second screw feeder controls the biomass feed rate of 10 to 20 kg/h. Main construction material in the hot loop section is SS, which turned out to be suitable. TSM reactor. The active length of the twin-screw reactor is 1 m; the inner and outer screw diameters are 2 and 4 cm, respectively; and the pitch is 0.2 m (see Figure 8). A typical rotation frequency is ca. 3 Hz (Froude number almost 1). The heat carrier mean residence time in the reactor of ca. 10 s is almost independent from the heat carrier flow as long as the heat carrier level is below about half. Kinetic measurements have shown that this time is sufficient for FP. 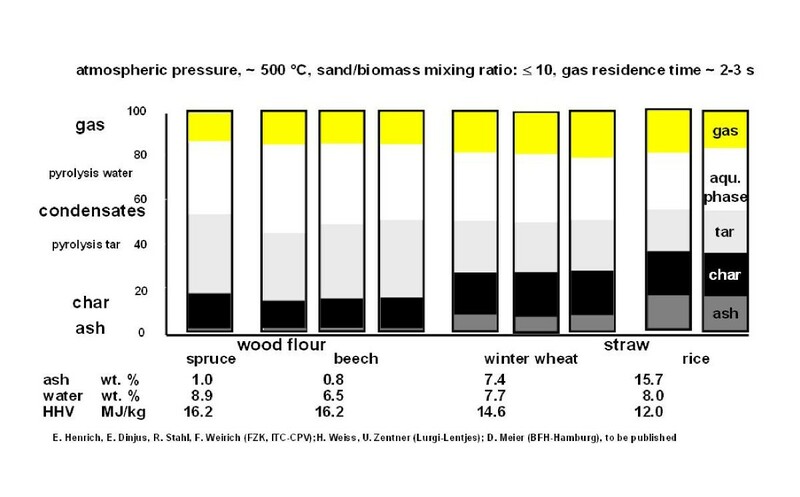 Figure 10 shows that the pyrolysis rate for < 2-mm wood particles are faster, especially for cereal straw which has a wall thickness of only 0.3 mm (0.15 mm characteristic length). From the bulk volume flow rate at typical operating conditions, it has been estimated that the reactor volume is usually filled up to only less than half, a sufficiently low level to prevent plugging. Pyrolysis kinetics of wood and straw. Product recovery system. The normal product recovery system consists of a hot cyclone operated at a reactor temperature of 500°C to remove the bulk of the entrained char particles. 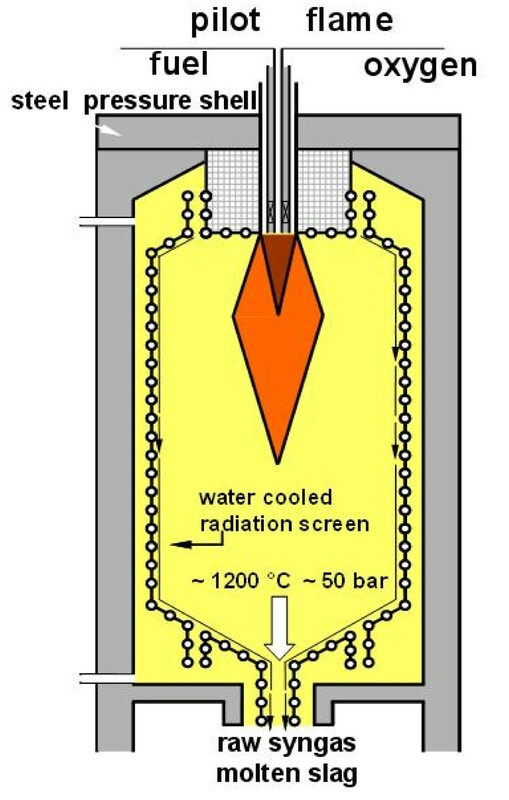 This is complemented by a subsequent quench condenser for flash condensation of tars and reaction water by the recycle and injection of a cooled quench condensate. In the KIT PDU, this system is frequently modified and tested in an iterative process to find the best way for a reliable recovery operation. Trouble with solid deposits can arise if sticky tars condense at the walls and collect char powder from the gas stream. At higher temperatures, the soft deposits decompose gradually to a hard, black, and highly porous material. Automatic or occasional mechanical removal of potential deposits is advisable at few critical sites to maintain a reliable continuous operation without interruption. The flow sheet in Figure 9 shows the actual test version for product recovery: after quick cooling to ca. 100°C in the presence of char, char crumbs are removed with condensed tar soaked and eventually solidified in the pore system. The more or less solidified tar in the pores deactivates the char and prevents self-ignition and char dust inhalation during handling. In addition to the operation of the KIT PDU, we have performed an experimental campaign at the 3- to 5-kg/h Mini-LR plant of Lurgi Company in Frankfurt. The main difference of the two facilities shown in the photos of Figure 11 is the design of the heat carrier loop, as outlined in Figure 12. Heat carrier in the Mini-LR plant is 1-mm quartz sand. It is lifted pneumatically with hot flue gas from pyrolysis gas combustion with air and simultaneously reheated to a maximum temperature of 600°C in direct contact with excellent heat transfer. Photos of the FP PDU at KIT (left) and of Lurgi's Mini-LR plant (right). Essential differences of the KIT and Lurgi FP heat carrier loop concepts. Because the flue gas has been in contact with pyrolysis residues in the heat carrier sand and is afterwards released into the atmosphere, the system is open to the environment and needs careful gas cleaning especially after contact with the char-contaminated heat carrier grains. To prevent the intrusion of the slightly pressurized lift gas into the pyrolysis reactor, it must be separated above and below by the flow resistance of a longer, sand-filled, pipe section of several meters in length. This increases the height and cost of the expensive hot loop section. Sand particle attrition must also be considered because of the high velocities of almost 20 m/s in the lift pipe. Successful industrial experience is claimed for this version. Mid-2005, after experimental confirmation of the principal suitability of the TSM reactor for biomass FP in the small KIT and Lurgi FP facilities and after four successful bioslurry gasification campaigns in the 3- to 5-MW(th), GSP-type, PEF pilot gasifier at a 26-bar pressure with up to 0.6 t/h (3 MW(th)) of bioslurry throughput (see the 'Bioslurry gasification' section), it has been decided to extend also the small-scale FP investigations to the pilot plant scale to determine design data for a FP demonstration plant. A 0.5-t/h FP pilot plant (2 MW(th)) based on Lurgi's industrial experience  with sand as heat carrier and a pneumatic lift in an 'open loop' version has been built up at KIT. A simplified flow sheet is shown in Figure 13. Figure 14 shows a photo, and in the study of Dahmen , a brief description is given. The plant is in operation since 2010 in test campaigns of typically 1 week in duration using straw as the feed material. Simplified flow sheet of the FP pilot plant at KIT. Photos of the 0.5-t/h FP plant at KIT. Meanwhile, the accumulated operating experience for FP of biomass in the PDU amounts to more than 2,000 h of operation with more than 100 individual runs and more than two dozens of different biomass types, e.g., hardwood, softwood, wheat, maize, straw, rice straw, hay, miscanthus, bran, different oil palm residues, sugar cane bagasse, etc. A typical run starts with the preheated facility and the heat carrier circulating in the loop at the correct operating temperature and circulation rate. At a feed rate of 10 to 20 kg/h of dry diminuted biomass, it takes several hours until a carefully pre-weight total amount of 40 to 80 kg of biomass is fed at a constant rate into the pyrolysis reactor. Several hours of steady-state operation turned out to be sufficient to get a reasonably accurate mass and energy balance for the solid, liquid, and gaseous products, whose percentages and properties are needed for the subsequent slurry preparation and gasification steps. A typical example of yield results for a FP campaign with a total of 19 runs for four different feedstocks is summarized in Figure 15 . The bars represent the average yields of three to seven identical runs for each feedstock. 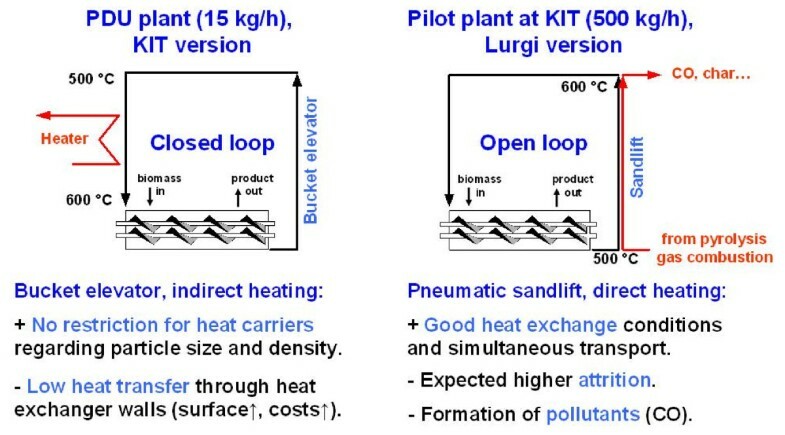 The same type of results is shown in Figure 16 for an experimental campaign in the Mini-LR plant of Lurgi Company, Frankfurt, performed in collaboration with KIT . The results are consistent within the error range. The mass yields of the liquid condensates from wood pyrolysis are three to four times higher than those of char and are more than sufficient to produce a free-flowing bioslurry (see the 'Bioslurry preparation' section). The yield of pyrolysis liquids from straw is much lower and only about twice the mass of char. At the expense of lower condensate yields, pyrolysis gas and char as well as the reaction water yields for straw are about 1.5 times higher than those for wood. The amount of reaction water plus moisture in the condensates has been determined by Karl Fischer titration. 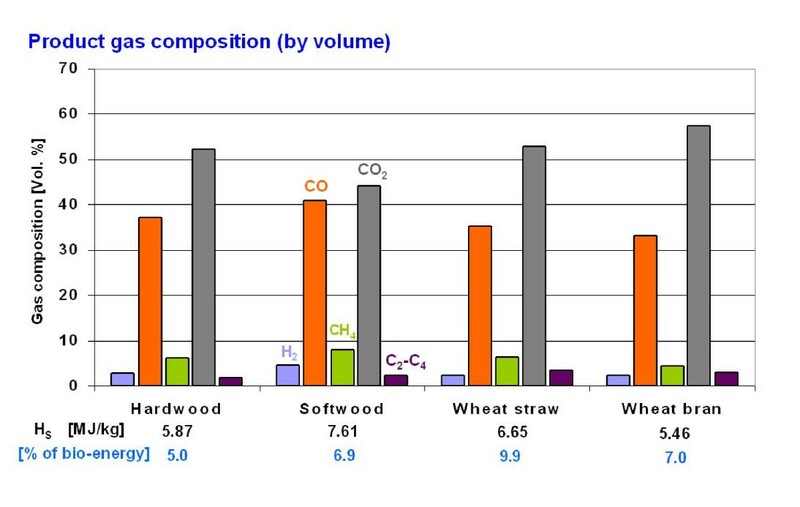 FP product yields for different types of biomass (KIT PDU) . FP product yields for different types of biomass (Lurgi's Mini-LR plant). 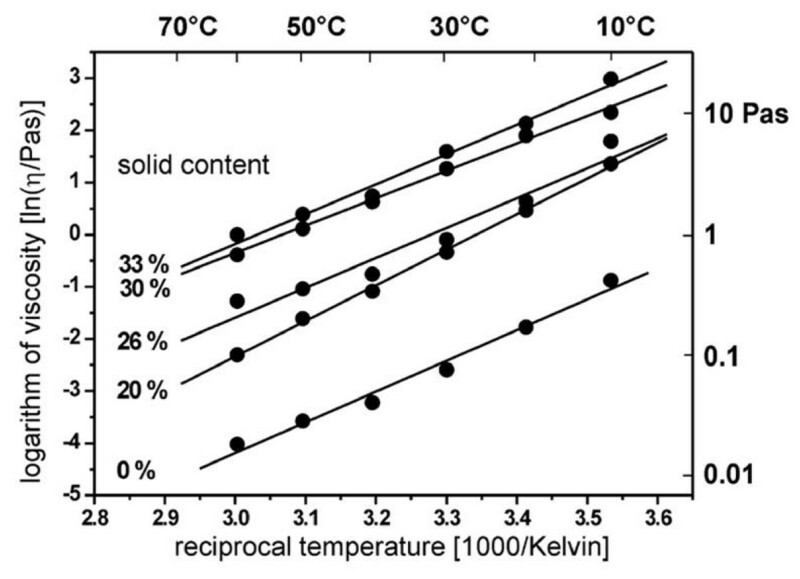 The stability of pyrolysis condensates towards phase separation into a heavy tar phase and a lighter aqueous phase decreases with increasing water content. Above 30 to 35 wt.% water, phase separation occurs almost immediately after condensation; we could never obtain a stable biooil from air-dry cereal straw. Even for some initially homogeneous biooil phases from wood with around 25 wt.% water, we have observed a delayed phase separation after several weeks or months. The typical composition of FP gases is shown in Figure 17. Main constituents are CO2 and CO. The minor constituents H2, CH4, and the gaseous hydrocarbons (C2-C5 alkanes and alkenes) contribute about half to the heating value. Vapors of very volatile CHO constituents like formaldehyde, acetaldehyde, acetone, methanol, glyoxal, methyl, ethyl esters of formic and acetic acids, etc. can escape with the gases, but have not been analyzed in detail so far. They are suspected to be responsible, at least partly, for the typical mass balance deficit of several percent observed when all measured constituents are summarized. Thus, a simple increase of the final condensation temperature can increase the energy content in the pyrolysis gas. Thus, an in-line control of the condensation temperature can be used to adjust the energy content in the pyrolysis gas exactly to the demand for a self-sustained process. Typical composition of FP gas (complement to Figure 16). Much effort has been devoted determining the specific heat required for FP. The reaction enthalpy (ΔrH) of an exo- or endothermal pyrolysis reaction must be subtracted from the sensible heat required to heat the pyrolysis products from ambient to 500°C. The higher the yield of the combustion products CO2, H2O, or the related char product in reaction 1 below, the more exothermal the pyrolysis reaction becomes. This can be illustrated with the idealized pyrolysis reactions in Table 4, using the experimental heat of combustion (ΔcH) of lignocellulose with the simplified formula C3H4O2 (ΔcH(= HHV) = -1,402 kJ/mol (according to the Channiwala relation ), ΔcH = 1,460 kJ/mol (experimental)) and the tabulated heats of combustion for the products. ΔcH, heat of combustion; HHV, higher heating value; ΔrH, reaction enthalpy. A self-sustained slow pyrolysis of completely dry, preheated wood in a rotary kiln was practiced commercially at Ford Motor Company until the 1930s [7, 65]. For FP with much lower char, CO2, and water yields, a thermoneutral or even endothermal pyrolysis reaction is more likely and depends on the product composition. The Channiwala relation overestimates the HHV of CO2, H2O, and char. In reality, the HHV of products are higher (less negative) and push ΔrH towards a more endothermal value. In the PDU, the overall heat consumption has been measured experimentally for various biomaterials. The amount of heat consumed for pyrolysis corresponds to the heat removed from the heat carrier, which is the known product of the heat carrier flow rate m ⋅ (in kilograms per second), the specific heat at reaction temperature cp (ca. 0.7 kJ/kg K for SS at 500°C), and the temperature difference ΔT between the reactor inlet and exit. In a small facility, the simultaneous heat in- or outflow through the reactor insulation must also be considered. The heat required for the pyrolysis of 1 kg of biomass is obtained by division with the biomass feed rate in kilograms per second. 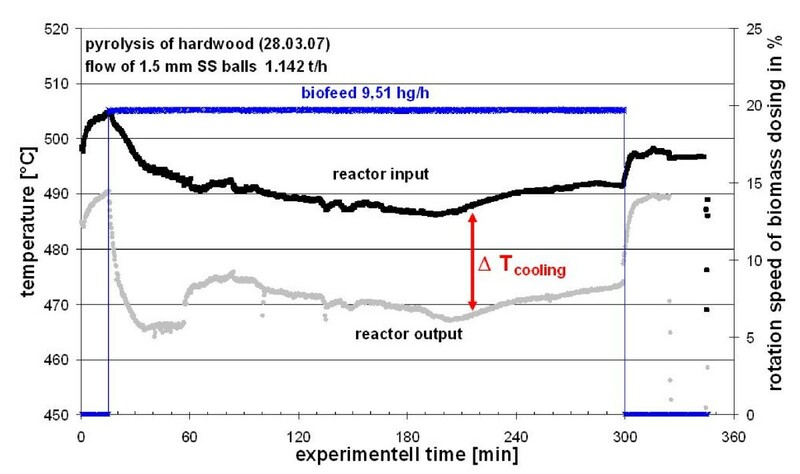 Figure 18 shows an example for the temperature drop ΔT in the reactor during a 4-h, stationary-state operation (60 to 300 min) in a typical run with a constant of 1.14-t/h SS ball heat carrier circulation at a 9.5-kg/h hardwood feed rate. In- and outlet temperatures of SS ball heat carrier. A mean heat consumption of 1.3 ± 0.4 MJ/kg for FP has been measured for dry lignocellulosics . Daugaard  has reported a range of 0.8 to 1.6 MJ/kg for FP for various lignocellulosics. This corresponds to about 7 ± 2% of the initial bioenergy. For moist materials, the value is somewhat higher since water needs 3.4 MJ/kg for heat-up from 20°C to 500°C. Antal and Gronli  have reported an about linear increase of the liberated reaction heat with increasing char yield with thermoneutrality in the range of about 20% char yield. Together with some thermal insulation losses, a consumption of ca. 10% of the bioenergy is therefore expected for FP in practice. 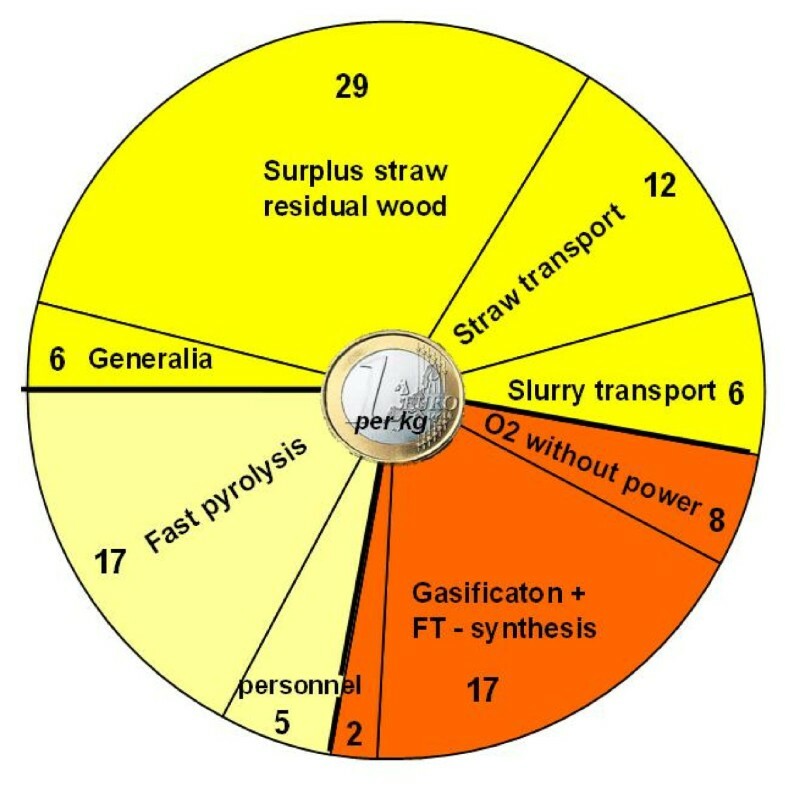 The pyrolysis gases contain 6% to 10% of the initial bioenergy without volatile oxygenates, and their combustion should supply sufficient energy for FP, at least at a somewhat higher final condensation temperature. Thus, all char and condensates remain available for bioslurry preparation, and there is no process waste except the flue gas from pyrolysis gas combustion. At the end, the pyrolysis gas is washed with the aqueous pyrolysis condensate and will be relatively clean. We have experimentally compared 1-mm quartz and SiC sand and 1.5-mm SS balls as heat carrier materials. The essential experience is that the SS balls are superior: The throughput of the PDU could be increased by at least 50%, and the availability of the facility and the reliability of operation could be improved considerably. The small amount of attrited fine sand, especially from SiC particles, caused some erosion in downstream pumps. The SS balls did not show attrition; after 1,000 h of operation, the mass of several hundreds of clean steel balls did not change within error, a hint to low wear and tear. The optimum FP temperature of ca. 500°C for lignocellulose is in the range where C-C bonds can form and break simultaneously. The decomposition of the biopolymer structures by FP creates a complex multitude of hundreds of different solid, liquid, and gaseous carbon species. We do not rely on any speculations concerning macro-kinetic reaction mechanisms to predict the lumped yields of char, organic condensate, reaction water, and gases for the various lignocellulosic bio-feedstocks in this complex system. Based on literature data and our own experiments, we have decided for a rather primitive and oversimplified yield prediction model for FP of lignocellulose at atmospheric pressure and at 500°C in a well-designed FP reactor. Lignocellulosic materials are divided into only two groups according to their ash content: < 2 wt.% (e.g., wood) and > 2 wt.% (e.g., straw). The lumped product yields for the water and ash-free lignocellulosic CHO fraction are given in Table 5. For a moist lignocellulose with ash, the ash must be added to the char, and the moisture, to the reaction water or the condensate. For the yield percentages related to the real material, the corrected numbers must be normalized to 100%. For highly ash-containing lignocellulose like straw, the char, gas, and reaction water yields increase by a factor of roughly 1.5, at the expense of the much lower tar yield. This can be explained by catalytic tar vapor decomposition at the ash and char surfaces. The relatively large yield fluctuations observed in practice indicate that the controlling feed properties and operating conditions are not yet completely understood. Table 5 is helpful to get a rough first estimate without much effort; experimental confirmation must follow. Eight LR mixer reactors have been built by Lurgi Company, Frankfurt up to a 1-m screw diameter and 600-m3/h heat carrier circulation . Reliable scale-up rules based on similarity criteria  have been developed by Peters . The volumetric feed rate V ∙ and reactor volume V should scale with the outer screw diameter d according to the following equation: V1/V2 = (d1/d2)2.5. An extreme and therefore less reliable extrapolation from a small 20-kg/h design in the PDU to 20 t/h in a large commercial plant corresponds to a 1,000-fold feed rate increase and an about 16-fold increase of a 0.04-m screw diameter to ca. 0.64 m and a 16 -fold screw length increase from 1 to ca. 5 m. A screw pitch of 2.5 m corresponds to a length/diameter ratio of 4. At a Froude number of 1, the rotation frequency in the 20-t/h plant is n = g/(2π2d)1/2 = 1.15 Hz. At a 12-s mean residence time and a 1,000-t/h SS ball circulation (ca. 210 m3/h or ca. 0.06 m3/s), the ball inventory is about 0.36 m3 or ca. 30% of the reactor volume. Per kilogram of lignocellulose, 50 kg of SS balls are circulated, which requires 1.3 ± 0.4 MJ of heat. With the specific heat for SS of 0.7 kJ/kg·K at 500°C, a heat-up of ΔT = 37 K is needed for 1.3 MJ. In view to some thermal loss, a temperature difference of at least 40 K seems reasonable; to cover extreme situations, a design value of about ΔT = 50 K is advisable. A twin-screw reactor with corrosion-resistant Incoloy 800 plated screws and a refractory liner at the reactor wall represents ≤ 10% of the total capital investment (TCI) for a FP plant. The remaining design and operating problems are expected to be proportional to the remaining capital expenditure (capex) of 90%, and potential problems arising in the reactor periphery should therefore not be underestimated. This statement is amplified by the fact that experience from large technical FP plants with the desired capacity does not exist; their state of development is the lowest in the bioliq process chain. The aim of the bioslurry gasification concept is the preparation of a convenient feed for a large PEF gasifier. For this purpose, it is unimportant if the FP plants are colocated at the gasifier site or distributed in the region. The latter option is attractive since the dense pyrolysis slurries or pastes are suited for easy handling, compact storage, and cheap transport, which favor the erection of a large and more economic central BTL plant. Optimum slurry properties are not necessarily the same for handling, storage, transport, or gasifier feeding. A stepwise preparation of the final feed form is therefore a good design guide. 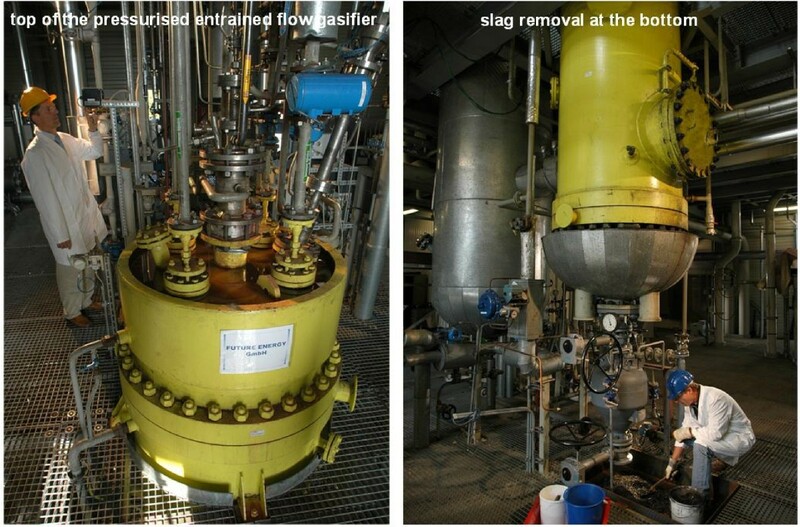 Final slurry preparation steps which are reasonable only at the gasifier site are heating for viscosity reduction using the abundant waste heat in the BTL plant and by feed temperature rise by about 10 K or more during efficient colloid mixing prior to feeding to ensure homogeneity without leaving sufficient time for sedimentation. Separate feeding of solid, liquid, or gaseous FP products to a gasifier is less favorable. Compression of dirty pyrolysis gases with much tar is difficult to realize for PEF gasification. If pyrolysis gases are fed to a large gasifier, the pyrolysis plants must be colocated. All biomass must therefore be delivered over larger distances directly to the central BTL plant. Increasing transport costs set an economic limit to the BTL plant size. A reasonable maximum biomass delivery radius for residual straw and forest residues in central Europe of about 70 km corresponds to ca. 1.4 Gt/a with a very small biosynfuel production capacity of only 0.2 Mt/a or 2% of a modern oil refinery. The same amount of biomass can be harvested in an energy plantation of only 30 km in diameter at an annual harvest of 20 t/ha. An advantage of colocation is that sufficient low-temperature waste heat is available in a BTL plant for drying moist feedstock like fresh wood with ca. 50 wt.% water, but storage of moist biomass above about 15 wt.% water is not possible without some biological degradation. Firing of pulverized, 50-μm coal is standard in large, coal-fired power stations. Coal particles are not porous, and large volumes of combustion air are available for pneumatic transport at atmospheric pressure. Different from that, pyrolysis or torrefaction char powders are highly porous and have a low pneumatic transport density of less than 300 kg/m3. Char powder transfer from a pressurized fluidized bed therefore requires large volumes of recycled inert syngas. This increases the raw syngas flow and the oxygen consumption, thus reducing the efficiency of syngas generation. The gasification agent oxygen cannot be used for char powder transport for safety reasons. Handling of large amounts of reactive pyrolysis char powders requires careful technical control of safety hazards like potential self-ignition, dust explosions, or inhalation of fine, filter-penetrating char dust. 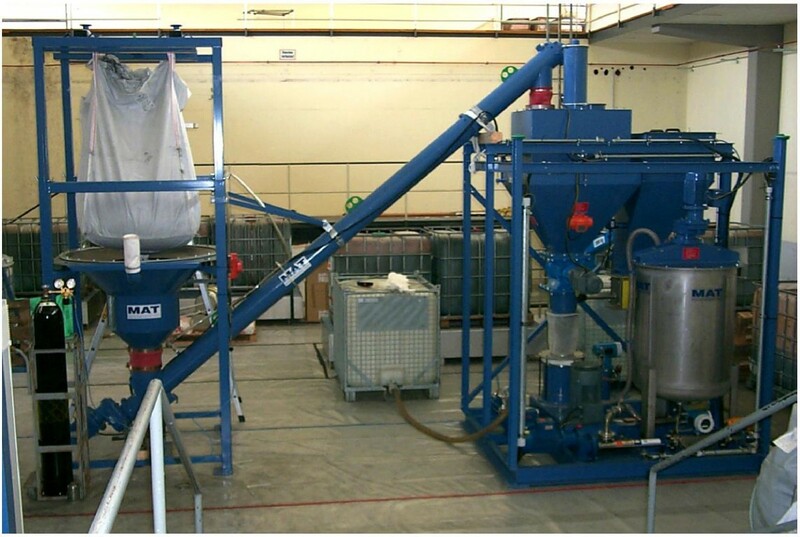 Intermediate pelletization improves safety and handling during storage and transportation. FP biooils from wood contain up to two-thirds of the initial bioenergy, biooils from ash-rich lignocellulosic materials like straw contain only about half. Straw biooils are less stable and prone to immediate or delayed phase separation. This is a general characteristic of poor biooils with more than 30 to 35 wt.% water. The heating value of the lighter, aqueous-phase condensates is too low for safe gasification. To increase syngas generation efficiency, biooil gasification must be supported by pyrolysis char addition. In a bioslurry, both products are combined in a single, dense stream which can contain up to ca. 90% of the bioenergy and simultaneously permits safe and easy handling of the reactive pyrolysis char powder. In the bioslurry concept, the pyrolysis gas supplies the thermal energy for the FP process. The gas carries small amounts of volatile pyrolysis vapors whose removal efficiency can be controlled by the final condensation temperature. Thus, the combustion energy can be exactly adjusted to the actual need. All non-gaseous products such as char, tar, and aqueous condensates are mixed together to a single, free-flowing slurry, pasty mud, or sludge stream. A small volume of condensate is completely soaked up, and char crumbs are formed. Any other waste liquids, slurries, pastes, or sludges with some heating value can also be used to slurry a char. Bioslurries are free-flowing mixtures of pyrolysis condensates and pyrolysis char powders below 100 μm in size. The char powder content should be as high as reasonably possible, normally at almost sedimentation density. Slurries with a particle volume fraction up to ca. 50% are still free-flowing and pumpable. This volume percentage is somewhat below the ca. 60 vol.% of solids in a bed of regular crystals or the 75 vol.% for a dense packing of spheres. Little volume expansion is sufficient to allow free particle movement similar to a fluidized bed. Pyrolysis chars have a high porosity between about 50% and 80%. The pore system first soaks up much liquid like a sponge until a sufficient volume remains as a 'lubricant' outside the particles (as visualized in Figure 19). As a rule of thumb, a liquid/solid (L/S) volume ratio of 1 corresponds to a biooil/char L/S weight ratio of about 2 to 3 in the slurry. This weight ratio is usually sufficient to prepare free-flowing slurries without much effort, at least after warming and colloid mixing. Pumpable slurries of nonporous, pulverized coal and water have been considered as a type of raw oil substitute during the oil crisis, e.g., for SNG production and have been prepared down to a L/S weight ratio of 0.4. A first crude estimate of the maximum char loading can be obtained from the bulk density of a slightly compressed pyrolysis char powder column, 300 to 400 kg/m3 corresponds to an L/S mass ratio of 2 to 3 at typical bioslurry densities around 1,200 kg/m3. During FP of wood without bark, typical L/S ratios of 3 to 5 have been attained; this is more than sufficient for slurry preparation. During FP of cereal straw with 5% to 10% ash, L/S ratios of about 2 have been measured, which is just at the acceptable limits. An L/S ratio of ca. 1.5 found for rice straw with 15% to 20% ash requires some additional efforts. The success depends much on the special properties of char and biooil; special bioslurry preparations with an L/S ratio as low as 1.6 have already been realized on the 1-t scale. Separate handling of some surplus char is another practicable option. Small char particles with a broad size spectrum from 100 μm down to ca. 1 μm allow higher loadings. The same is true for a bimodal size distribution, where the ca. 10 times smaller particles can pass into the interstices of the larger grains. Using steel balls with diameters of a few millimeters as heat carrier, the TSM acts like a ball mill and produces a fine powder from the brittle pyrolysis char. A substantial part of the pyrolysis chars are larger aggregates of smaller porous char particles. Deagglomeration in a colloid mixer liberates some interstitial liquid for use as a lubricant. A combination of char diminution to less than 100 μm, deagglomeration, and homogenization in a colloid mixer combined with stepwise warming and further in-line preheating under pressure immediately before gasification are essential ingredients for a successful final bioslurry preparation. Slurries with small char particles in a size range of a few tens of micrometers and below, mixed into a relatively viscous, single-phase biooil, remain homogeneous for weeks or months. Larger char particles and char crumbs suspended especially in aqueous condensates with a low, water-like viscosity tend to undergo sedimentation in the course of an hour or a day. Sedimentation can be prevented by the addition of a gelling agent, e.g., about 3% flour (starch) . A simpler measure for unstable slurries is remixing immediately before gasifier feeding and immediate flushing of feed pipes after a shutdown or a feed stop. Pastes, muds, or sludges are generated when the char content exceeds the sedimentation density at a L/S weight ratio below about 2, but this is not a sharp limit. The rheological properties of these concentrated biooil/char slurries, pastes, muds, or sludges are not known well enough at present to justify much discussion. Pastes are not free-flowing and therefore do not run out in case of a vessel leak and are not soaked into the soil in case of an accidental spill. In case of frost, especially during transport, a paste freezes more slowly and with less dehomogenization. These are desirable properties for storage and transport. Transfer with pumps must be replaced by a more rapid gravity discharge from silo transport containers into a vessel below. Transfer pumps might also turn out to be too slow and expensive even for simple discharge of large slurry volumes. Char/tar crumbs are a special handling form, which is being investigated with the aim to simplify the whole FP product recovery procedure. 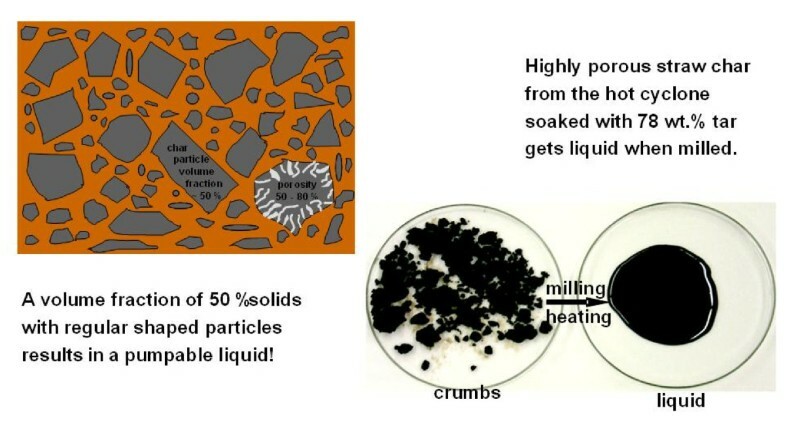 Char/tar crumbs are obtained by a partial quench of the FP product stream to about 100°C immediately downstream from the pyrolysis reactor. For that purpose, a controlled fine spray of aqueous FP condensate is dispersed for fast evaporation cooling in the presence of all char. The condensed high-boiling tar constituents are soaked into the char pore system and eventually solidified there. This reduces the pore volume and the amount of liquid required for slurry preparation later on. After the removal of the char crumbs from the gas stream, an aqueous pyrolysis condensate is recovered by conventional means. A clean part of this aqueous condensate is recycled for spray quenching in the first stage, and the remainder is used for slurry preparation. No hot cyclone is needed for this process version. Various bioslurry production and characterization procedures are being investigated in the laboratory and have been used on pilot plant scale. This section confines to some essential aspects; more details have been reported in the literature [37, 38]. Essential principles are depicted in Figure 19. The importance of (1) the minimum L/S weight ratio of about 2, (2) char particle deagglomeration in a colloid mixer by high shear stress in the order of ≥ 10-4/s, and (3) heating for viscosity reduction have already been mentioned. Many viscosity measurements have shown that a temperature increase of 50 K decreases the slurry viscosity by about an order of magnitude as shown in Figure 20. Heating a bioslurry under pressure by at least 100°C can reduce a high, room-temperature viscosity of 30 Pa s down to 0.3 Pa s, a sufficiently low viscosity for efficient pneumatic atomization with oxygen in the special gasifier feed nozzles. 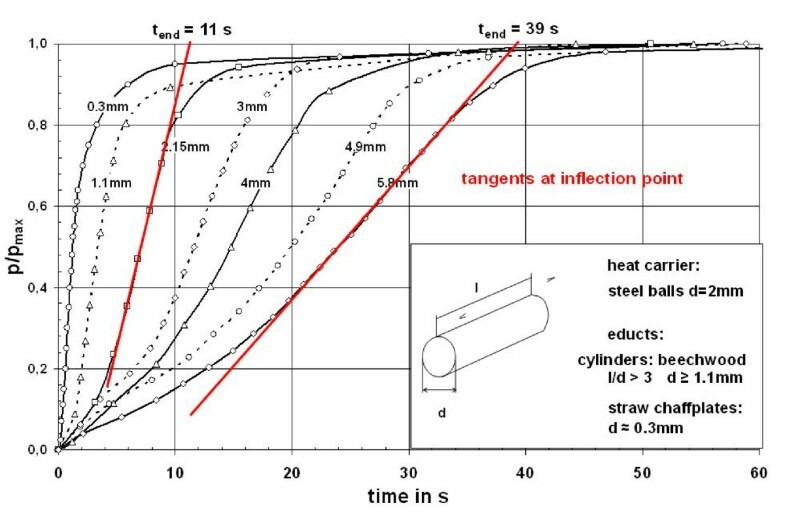 Temperature dependence of viscosity for various bioslurries. Some observations are briefly summarized: Bioslurries have the same unpleasant smoky and acrid smell as the biooils and must be handled in closed systems. During phase separation of poor-quality biooils, a heavy, hydrophobic tar phase settles at the bottom and collects most of the suspended char particles. In rare cases, a small volume of a third phase of light hydrocarbons (e.g., turpentine-like) also accumulates simultaneously as a thin layer at the surface of the aqueous phase [70, 71]. An important progress on the way to higher char loadings and more homogeneous and stable bioslurries was the use of a colloid mixer. The machine has been designed by MAT Company, Immenstadt, Germany, for the robust production of concentrated cement lime in the building and construction industry. The slurry, 2 to 5 kg in the lab-scale colloid mixer, is contained in a continuously stirred tank reactor and passes several times through a section with rapidly rotating, perforated paddles with narrow, ca. 1-mm gaps to the wall and a high shear field. The robust construction and operation and the rough power for the high shear rate exerted heat the slurry by some kelvin or more than 10 K, increasing with the mixing time and speed. For the bioslurry gasification campaigns in the 0.3- to 1-t/h PEF pilot gasifier at Freiberg, a total of about 40 t of pumpable bioslurries have been prepared from different biomass and different pyrolysis conditions. From the few and sparsely operated FP pilot facilities, such ton amounts are hardly available. In most cases, we have therefore used the comparable products from conventional beech wood pyrolysis  for charcoal production with the Degussa process (proFagus Company, Bodenfelde, Germany): A grainy charcoal fraction was milled in a ball mill to various sizes from 100 down to 10 μm. An organic condensate with a composition similar to a single-phase FP biooil from wood and an aqueous-phase condensate with 70% water with dissolved organics, mainly acetic acid, resemble the aqueous phase of phase-separated, low-quality biooils . A real FP biooil from hardwood has been obtained from Dynamotive Company (Vancouver, Canada). At KIT, several tons of char and biooil have also been produced from cereal straw pellets in an auger reactor which was partly heated electrically from outside and partly by hot steel balls of 15 mm in diameter . This process with a few hundreds of seconds of residence time is termed intermediate pyrolysis mode and achieves only slightly lower liquid yields compared to FP. For the very first slurry production for pilot-scale gasification experiments, several tons of biooil were continuously circulated at ambient temperature with a screw pump via a 1-m3 PE mixer vessel equipped with a simple propeller agitator and a 2-kW electromotor. Charcoal powder was continuously added near the stirrer shaft until the desired slurry loading was attained. In the next bioslurry gasification campaign, we have used a commercial 0.25-m3 batch colloid mixer from MAT Company for a slurry production rate of 0.5 t/h. In the following campaigns, we have used a continuous colloid mixer for a maximum of ca. 1-t/h bioslurry production from the same company. The whole mixer station is shown in Figure 21 and will become part of the bioliq pilot facilities. Continuous 1-t/h bioslurry preparation with colloid mixer. A large-scale BTL plant for 1-Mt/a biosynfuel production in 8,000 h/a needs about 600 t/h or 500 m3/h (0.14 m3/s) of bioslurry. A delivery of bioslurries or pastes with whole trains (24 wagons with a total of 48 silo containers with a 20-t capacity) requires about 1,000 t. Train delivery every 1.5 h is a tolerable traffic density. Secure unloading of a 20-t silo container every 2 min can be managed by gravity unloading with at least two unloading stations. Sugar beet discharge from the delivery trucks in a modern sugar mill is a comparable process. 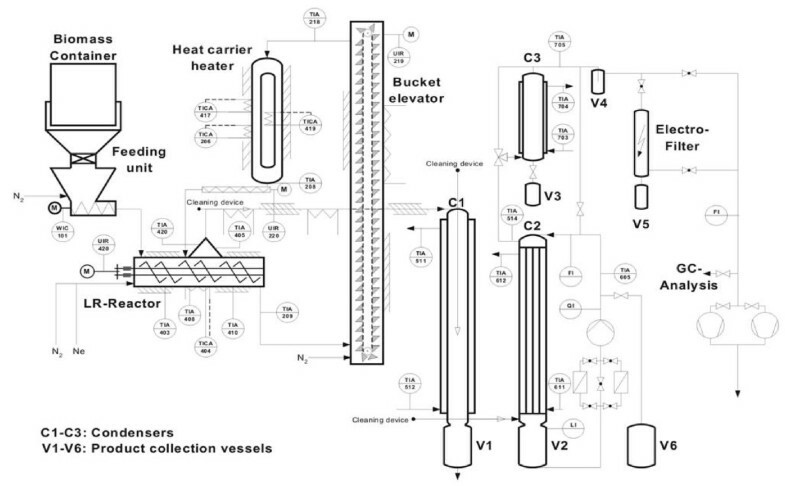 The gasifier feed can be prepared batchwise in cyclic operation in several huge bioslurry mixing vessels. A carefully selected slurry menu for ca. 1-h gasifier operation is prepared by mixing and warming up ca. 30 preselected transport silos. The adjusted, warm, and viscous bioslurry is transferred with screw or plunger pumps to a colloidal mixer for efficient final homogenization. Further slurry transfer to the gasifier is then performed under pressure via a pressurized slurry heater. The high gasifier feed rate of 0.14 m3/s into the gasifier burner corresponds to a slurry injection area of 0.07 m2 at a 2-m/s injection velocity. The design of the large multi-burner head in the gasifier is a challenge. A dangerous, accidental, sudden, and total feed interruption is unlikely with so many feed points (see safety consideration in the 'Further operation and development aspects' section). Co-firing of bioslurries into pulverized, coal-fired power stations is technically possible. The HHV of 1.4 t of bioslurry corresponds to about 1 t of hard coal; the subsidized German coal prices of ca. €300/t are almost comparable. 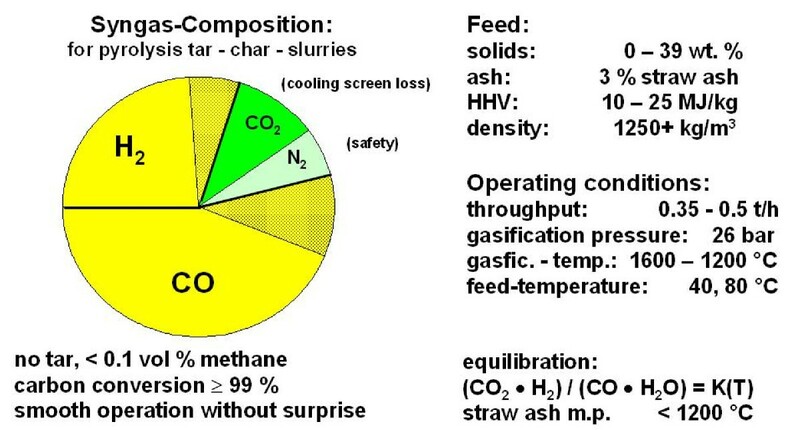 Biomass ash and coal ash are different; this has to be considered, e.g., in case of fly ash use for cement production. The central step in the bioliq concept is the gasification of pumpable, char-, and ash-rich bioslurries from biomass pyrolysis in a PEF gasifier with a cooling screen. The feasibility of the concept was successfully verified in a 2- to 5-MW(th) PEF pilot gasifier built by Noell Company in 1996 for the further development of their hazardous waste conversion process . The photo in Figure 22 shows the top and bottom sections of the pilot gasifier. The KIT has rented the pilot gasifier facilities from the successive owners (Babcock Borsig Power (BBP), Future Energy, Sustec Company; no campaign with the present owner of Siemens fuel gasification technology (FGT)) for four bioslurry gasification campaigns in each year from 2002 to 2005. For operation, the old, experienced crew from the previous DBI in Freiberg who developed the gasifier worked together with KIT personnel to transfer also some practical experience. The facilities are unfortunately not equipped for tests of the syngas cleaning and synthesis steps of the bioliq process. A 3- to 5-MW(th) PEF (GSP-type) pilot gasifier with cooling screen in Freiberg, Germany (2005). A total of 40 t of different bioslurries have been prepared by mixing 20 to 36 wt.% of either (1) milled charcoal with a typical LHV of 31 to 32 MJ/kg and an ash content of 2 wt.% or (2) pyrolysis char from cereal straw with a HHV of 25 to 26 MJ/kg and an ash content of about 15 to 20 wt.% into the following pyrolysis condensates: (a) a raw wood tar condensate from charcoal production from the Degussa process with a LHV of ca. 19 MJ/kg and a density of 1,160 kg/m3; (b) an aqueous condensate, so-called 'raw wood vinegar,' with an LHV of 2 MJ/kg and a density of 1,030 kg/m3; and (c) a condensate from intermediate straw pyrolysis  which had a LHV of 6 to 7 MJ/kg and is - as all other mainly aqueous condensates - not suited for direct gasification, only after addition of sufficient char powder to increase the HHV to at least 10 MJ/kg or more. To generate a realistic straw slag layer at the inner surface of the gasification chamber, 3 wt.% of real straw ash - from the 3-MW(th) straw combustion facility in Schkölen, Germany - plus 0.3 wt.% KCl have been added to most slurries. Together with the ash content of the char, a total of about 4 wt.% ash has been present in the slurries. In the presence of about 50% SiO2 and much potassium, typical ash melting points are below 1,200°C. The following gasification conditions have been adjusted: a pressure of 26 bar and a temperature of 1,600°C to 1,200°C. A constant bioslurry feed rate of 0.35 to 0.6 t/h was maintained with a screw or plunger pump. The pressurized slurry stream was preheated to 40°C or 80°C by the immersion of the transfer pipe into hot water. Pressurized oxygen was generated by the evaporation of liquid O2. In a special gasifier nozzle, the slow slurry stream was pneumatically atomized by a fast oxygen stream with a relative velocity of more than 100 m/s to supply sufficient energy for efficient atomization. To attain the high gasification temperature of 1,200°C or more, the oxygen mass flow must be almost half of the bioslurry mass flow (see Figure 23). Set of coherent stoichiometric chemical equations for the successive steps in the bioliq process. Because of the short gas residence time of only a few seconds in the gasification chamber and the low heat capacity of the membrane wall plus slag layer, new thermal stationary-state conditions after a change of the operation parameters have been attained in about an hour and have usually been kept for at least 2 h or more to characterize the stationary status by measurements. During each campaign, five to eight different stationary-state conditions have been studied. The slag residence time on the membrane screen is considerably higher, and after a change of the slag composition, it takes much more time in the range of 1 day until a new stationary slag layer has been built up. For the moment, slag layer equilibration problems have not been studied: In all our gasification experiments, we have kept the same straw slag composition, yet experiments with changing ash composition and longer and more expensive run times remain to be done. The results of the many gasification runs in the pilot gasifier [74, 75] are not presented in detail since the heat loss through the cooling screen is large because of the large surface-to-volume ratio in the relatively small, 5-MW gasifier and amounts up to about 20%. Corrections are complex and need extended explanation. The oxygen consumption in the pilot gasifier was found in the oxygen/fuel stoichiometry range of λ = 0.4 to 0.5. In a 100 times larger technical gasifier, the corrected stoichiometry ratio λ would be about 0.1 or 20% lower at values between 0.3 and 0.4. Carbon conversion efficiency at higher temperatures has always been above 99%; even 99.8% have been calculated from the carbon measured in the slag and in the quench water. Above 1,200°C, the methane content in the syngas has been below 0.5% and usually even below 0.2% by volume. Among the potential tar constituents, only benzene could be found, in cooperation with the Paul Scherrer Institute, Switzerland, in amounts below 100 ppm. In general, the operation of the gasifier was smooth as expected and without surprise. Uncorrected experimental data from the pilot gasifier are compiled in Figure 24. The data are consistent with the expectation that the equilibrium of the CO-shift reaction is attained in the hot gasification chamber and maintained by the rapid total quench with an excess of cold water spray directly at the hot gasifier chamber exit. Depending on the detailed bioslurry composition, the dry raw syngas composition expected in a large technical PEF gasifier would be almost 60 vol.% CO and around 30 vol.% H2, almost 10 vol.% CO2 and few volume percent N2. All essential gasification results with corrections for the screen loss are briefly summarized in Figure 25. Gasification conditions and syngas composition for bioslurry gasification experiments in the Freiberg PEF pilot gasifier. Corrected results from the PEF pilot gasifier without thermal screen loss corrections . Modeling a PEF gasifier in regard to the prediction of the product composition is relatively simple because at high gasification temperatures of ≥ 1,200°C and pressures of ≥ 25 bar, the thermodynamic equilibrium is quickly attained. Preconditions for a fast gasification are an efficient pneumatic bioslurry atomization and mixing with oxygen and a biochar particle size below 100 μm. At an oxygen injection velocity of > 100 m/s relative to the slurry, the kinetic energy is sufficient for efficient atomization and mixing. The oxygen demand for an overall exothermal gasification reaction at an adiabatic reaction temperature of 1,200°C can be reliably estimated from the stoichiometric gasification equation (see Figure 23) using tabulated thermodynamic data for the products. For bioslurries produced by FP of a dry lignocellulose, this results in a λ value of ca. 1/3, corresponding to a considerable oxygen mass of almost half the initial dry biomass. CO + H 2 O ⇆ C O 2 + H 2 ; K ( T ) = p ( C O 2 ) ⋅ p ( H 2 ) p ( CO ) ⋅ p ( H 2 O ) = exp ( 4 , 578 / T - 4 . 33 ) ; T in K .
At high pressures and temperatures, equilibrium is quickly attained within seconds. 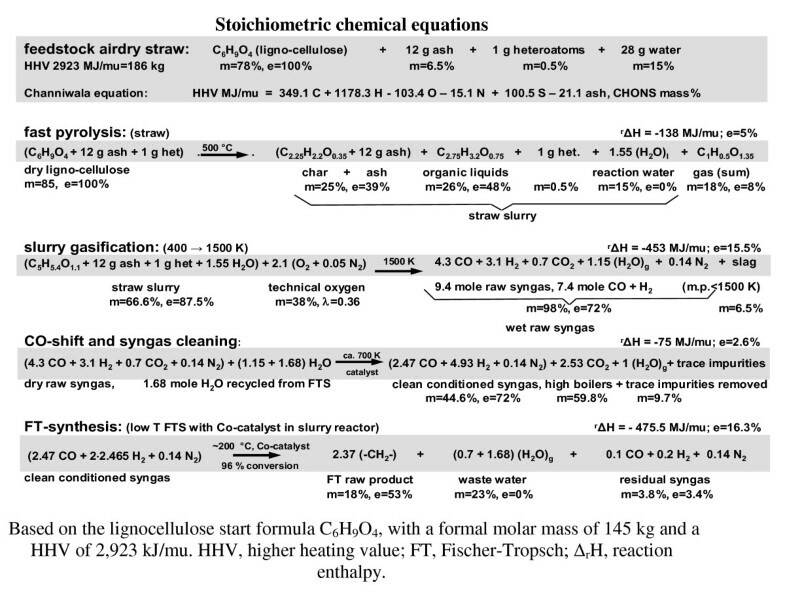 The equilibrium of the homogeneous shift reaction is sufficient to characterize the thermodynamic situation in the gasifier chamber: With typical bioslurries, a dry raw syngas (CO + H2) content above 80 vol.% (see Figure 23) is attained with H2/CO ratios around 0.5 to 1. Thermodynamic estimates are consistent with the experimental results of our gasification campaigns in the PEF pilot gasifier at Freiberg and also with general experience with PEF gasifiers. When the hot raw syngas is cooled down, the equilibrium methane content can increase, and the thermodynamic soot formation limit is crossed slightly below 1,000°C. Soot and methane formation have been prevented in our runs by a rapid total quench to ca. 180°C via injection of a water excess. Soot and methane formation became too slow, and the high-temperature equilibrium is frozen. About 1 h after the start of the cold pilot gasifier, stable thermal conditions could be attained. After a change of the operating conditions, it took less than 1 h until new, stationary-state, thermal conditions are adjusted. This is true if the amount and the composition of the slag layer at the inner surface of the gasifier chamber do not significantly change. The formation of a completely new equilibrium slag coating is slower and takes several hours up to a day. The higher the ash content in the feed, the faster an equilibrium slag layer is formed. Effects of changing slag properties, e.g., by addition of fluxes, have not yet been investigated. Beside normal operation, start-up, shutdown, and standby operations deserve consideration. Within the huge and extended BTL complex, the gasifier section plays a special role. In the gasifier, an auxiliary burner for a clean natural gas or liquid fuel is needed. The auxiliary burner heats the cold gasifier to the desired temperature before the controlled gradual switch-over to a bioslurry feed takes place. Auxiliary fuel is also required for shutdown and short-time standby operations. During a planned shutdown, the bioslurry feed in the piping system is replaced by clean liquid fuel. Thickness and composition of the slag layer in the gasifier are also adjusted. A sudden emergency shutdown is different and outlined in the 'Emergency' section. In PEF gasifiers with a membrane wall (cooling screen), the heat capacity involved in temperature changes is low. The thick, heavy, and pressure-resistant outer mild steel cylinder behind the cooling screen has an almost constant temperature slightly below the 250°C to 300°C of the pressurized cooling screen water, and the mechanical stability remains high. The temperature drop and rise affects only the slag layer and the SiC liner at the inner surface of the membrane wall. Assuming a 2-cm-thick SiC liner plus a 2-cm-thick slag layer results in ca. 40 L or about 0.1 t of material/m2. For a large PEF gasifier with a bioslurry plus an oxygen throughput of 0.15 t/s and a typical raw syngas residence time of 3 to 4 s, the stationary raw syngas mass in the gasification chamber amounts to less than 1 t. A PEF gasifier with an inner membrane wall surface of 100 m2 in a ≥ 1-GW(th) gasifier has a slag mass inventory on the order of about 10 t. Heat-up can be attained in a start-up period of less than 1 h.
A safety analysis for the whole BTL plant is complex, and here, only the gasifier is considered. The most credible major accident is the injection of cold oxygen or air into a reservoir of highly pressurized syngas. In a pressurized process, this is unlikely, but it can happen when the bioslurry feed into the gasifier suddenly stops or a drastic drop in the slurry heating value occurs and the oxygen flow continues. Countermeasure is an immediate stop of the oxygen inflow within a second. This must be securely guaranteed by several fast control measures with diverse methods. Some design and operating characteristics of a large PEF gasifier contribute to safety. A multi-burner head in a large gasifier with several independent feed lines is unlikely to fail simultaneously. The extremely hot syngas ensures immediate oxygen combustion without accumulation of a combustible gas mix and subsequent explosion. The energy in the syngas inventory in the gasification chamber is limited and combustion would mainly cause a heat-up and meltdown of the large slag inventory. Gasifier operation with unstable biooils can be dangerous, e.g., if a plug of unobserved aqueous condensate with a low-heating value suddenly enters the gasifier. In dense slurries, the effects of phase separation are suppressed by the large amount of char present. An oxygen breakthrough into the cold syngas reservoirs below the ignition temperature downstream from quenching presents the major hazard. A sudden emergency shutdown is easily digested by the gasifier; parts of the slag liner will crack off from the SiC layer without causing damage, and the gasifier remains ready for immediate restart. The sensible heat in the 1,200°C hot raw syngas amounts to 15% to 20% of the initial bioenergy (see Figure 23), depending on the feed composition and the gasification temperature. Heat must anyway be removed from the raw syngas prior to cleaning. During syngas cooling, thermodynamic methane formation is favored, and the soot formation limits are crossed slightly below 1,000°C. Soot and methane formations have been suppressed to acceptably low levels by fast quench cooling to low temperatures with frozen equilibrium. At temperatures above 600°C, volatile salts like KCl and entrained tiny and sticky slag (eutectics) droplets can cause technical problems. Large radiant heat exchangers can help but are expensive [77, 78]. In our experiments, we have applied a simple total quench with excess water injection and recirculation. This option is technically simple and secure but causes the highest energy loss. Another option is total or partial quenching by recycling of cooled syngas; 500°C may be sufficiently low. Heat recovery from the hot raw syngas is not yet satisfactorily solved and needs further development. The reaction enthalpy of gasification must be sufficient to heat the products - mainly CO, CO2, H2, H2O plus some slag - from ambient to ca. 1,200°C. If the feed is preheated, less oxygen is required, and the syngas yield increases correspondingly. In the pilot gasification experiments, the bioslurries were preheated at 26 bar to a maximum of 80°C using hot water. Pressurized bioslurries and oxygen can probably be preheated under pressure up to 150°C in a heat exchanger immediately prior to atomization in the gasifier using the abundant process waste heat. Even moderate preheating to 120°C can improve the syngas efficiency by more than 1%. The maximum temperatures which still guarantee sufficient short-time stability of the bioslurries have not been investigated in detail so far. The slurry decomposition limits during feed preheating are important and deserve further investigation. Precondition for fast and complete bioslurry gasification is an efficient mixing with oxygen. Gasification reactions proceed in the premixed turbulent downward gasifier flame in about a second and are completed by a few seconds of mixing the whole hot gasification chamber with the flame. The rate-controlling steps in a well-mixed flame are the heterogeneous gasification reactions of the porous char particles. This was confirmed by fluid dynamic simulations [79, 80]. In the pilot gasification campaigns, it has been observed that char particles ≥ 0.2 mm escape unconverted into the slag. At the high temperatures and pressures, the gasification rate is fast and proceeds in the film diffusion regime and is thus almost independent from temperature. The lower the temperature, the lower the oxygen consumption and the higher the syngas efficiency, at least until increasing methane formation or low gasification rates sets a lower limit. The lowest possible gasification temperature is therefore determined in most cases by a sufficiently low slag viscosity. Flux addition can be helpful to reduce the slag melting point to a reasonably low value. The large amounts of straw slag have usually sufficiently low melting points because of the high potassium contents. The smaller amounts of higher melting wood slag require either co-gasification with straw or flux addition. In the film diffusion regime, the gasification rate increases with about the square root of pressure. A crude extrapolation from the 130-MW(th) GSP gasifier chamber at Schwarze Pumpe with a 2-m diameter and a 3.5-m height operating at 26 bar results in 1.8 GW(th) for a 4-m diameter and a 7-m height at an 80-bar operating pressure. A stepwise scale-up of the GSP gasifier to 0.5 GW(th) has already been realized by Siemens FGT in coal gasifiers in China, and further scale-up is intended. The heat loss through the membrane wall with values of 0.1 to 0.2 MW(th)/m2 drops to below 1% for large-gigawatt gasifiers and becomes negligible. PEF gasifiers have already been operated with natural gas, pulverized coal, or coal dust/water slurries. Large GTL and CTL plants are already in operation and can be combined with BTL plants to flexible multi-feed x-to-liquid (XTL) facilities in the future. During a transition period with gradually decreasing crude oil supply, development and market introduction of XTL synfuel plants is a reasonable and precautional strategy. Biosyngas cleaning procedures for bioliq have not yet been investigated so far on a larger scale but are included in the future bioliq R&D and pilot plant development program [42, 81]. Not only the conventional syngas cleaning options will be considered, but also special hot gas cleaning technologies as under construction in the pilot plant. Another special task is the investigation of possibilities to eliminate the technically complex and expensive CO-shift reaction by integration of the shift into the final synthesis. As an example, the DME synthesis is described in the following 'DME synthesis' section. With an initial C6H9O4 composition for dry lignocellulose and a temperature of 1,200°C in a PEF gasifier, a raw syngas with a low H2/CO volume ratio of 0.5 to 0.7 is generated (see Figure 23). 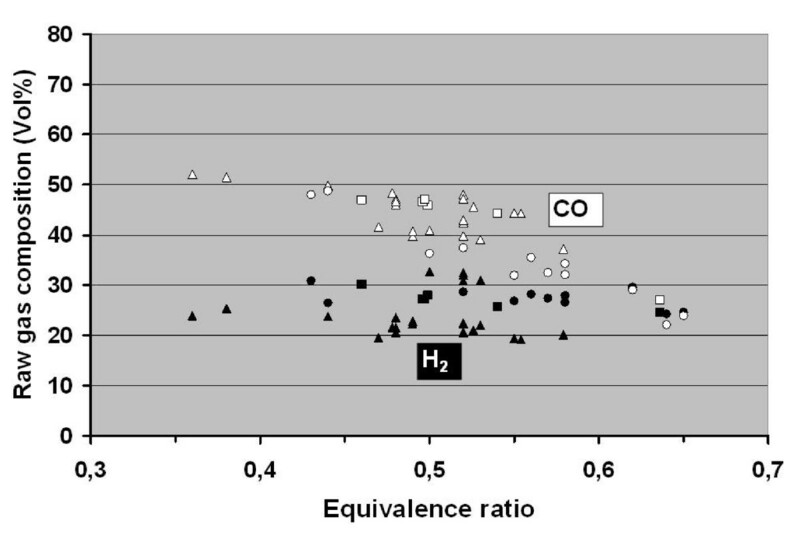 A H2/CO volume ratio of about 2 is optimum for methanol synthesis with Cu catalysts or FT synthesis with Co catalysts; about half of the CO must therefore be converted to H2. For DME synthesis, a H2/CO ratio of 1 is sufficient. Without the technically complex and expensive CO-shift step, raw syngas cleaning would be limited to the much cheaper removal of undesired trace constituents, acting as catalyst poisons. A much higher thermodynamic synthesis yield for DME can be obtained in a single pass through the catalyst bed (see Table 6) . Methanol synthesis requires much expensive recycle of unconverted syngas. DME, dimethyl ether; ΔrH, reaction enthalpy; ΔrG, Gibbs free energy. DME is usually produced in a two-step process: (1) methanol from syngas and (2) methanol dehydration. The conditions for both reactions can be selected independently from each other. A one-step process at mutually harmonized synthesis conditions offers economic advantages especially for large-scale production. A highly selective Cu-ZnO-Al2O3 methanol catalyst acts also as a low-temperature CO-shift catalyst at the usual methanol or DME synthesis conditions. If a dehydration catalyst, e.g., γ-Al2O3 or a zeolite (e.g., HZSM-5), is admixed for methanol dehydration to DME, the reaction water will be consumed on-site in the CO-shift reaction. In a dry syngas, this allows a reduction of the H2/CO ratio to at least 1; in a moist syngas, it may be even lower. It would be a big economic advantage if the technical effort for a CO shift plus downstream CO2 removal in the syngas cleaning and conditioning train is not needed. The three simultaneous key reactions 1, 2, and 3 in the catalyst bed are given in Table 6, together with their ΔrH and ΔrG values. These thermodynamic data show the highly exothermal ΔrH and the equilibrium Gibbs free energy ΔrG = -RT lnK, but no details of the rather complex heterogeneous reaction kinetics and mechanisms. Catalyst design must therefore rely on experimental data. For the sum reaction 4, it can be calculated that the equilibrium for a H2/CO ratio of 1 at 250°C and a 50-bar pressure is at 95% conversion to DME . This seems to be high enough for a single pass conversion without recycle, at least in a two-stage synthesis reactor with intermediate DME removal. 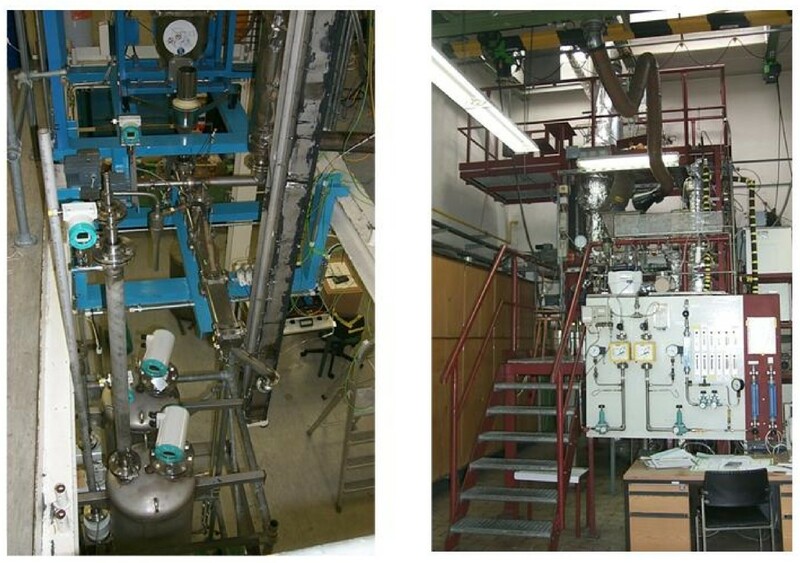 The considerations above have been successfully realized in a lab-scale facility shown in Figure 26. The bifunctional catalyst was a mix of 1 or 1.5 g of a commercial Cu/ZnO/Al2O3 methanol catalyst and 1 or 0.5 g of γ-Al2O3 as a dehydration catalyst, with a grain size of ca. 0.5 mm and a volume of ca. 2 ml. Operating pressure and temperature ranges were 25 to 50 bar and 200°C to 275°C, respectively; catalyst deactivation starts at 280°C by the sintering of the methanol catalyst. The gas flow was 3.3 to 6.5 NL/h; the syngas H2/CO ratios were 2, 1, and 2:3. The syngas has been diluted with 70 vol.% Ar to guarantee isothermal conditions in the small, thermostatted reactor. Catalyst activation procedures were performed according to manufacturer's instructions. Laboratory synthesis device (0.2 m 3 /h, 300°C, 60 bar). Suitable DME synthesis conditions at a H2/CO ratio of 1 have been found at 250°C and 50 bar. Both methanol and water vapor concentrations in the product gas have always been low and near the detection limit [46, 47]. This confirms the above mentioned considerations that dehydration and CO shift are fast reactions. The investigations have been extended using different catalysts, temperatures, space/time velocities, and H2/CO ratios . The major hurdle for biosynfuel introduction into the market is the higher price compared to untaxed, oil-derived motor fuels, though synfuels have higher purity and quality and can be tailored for innovative internal combustion engines. Recent cost estimates for the bioliq BTL process [83–85] are summarized in the following. Indispensible bases for an economic analysis and modeling are reliable mass and energy balances. For the sequence of chemical reactions in the bioliq process, our experimental results and complementary literature data have been condensed into a coherent set of empirical chemical stoichiometric equations. All equations in Figure 23 are based on a water-, ash-, and heteroatom-free lignocellulose start 'molecule' with the formula C6H9O4, formal molecular mass = 145 kg/mu, combustion heat ΔcH = -2,923 MJ/mu. The usual thermodynamic tools can be applied to these chemical equations. To represent the reality, moisture, ash, (nonvolatile inorganics) and heteroatoms (e.g., N, S; volatile, non-CHO elements) have been added to the organic lignocellulose fraction. Dry lignocellulose from wood and straw differs in good approximation only in the ash content of about 1 or 6 wt.% on the average. Mass (m) and energy (e) percentages are given for each reaction partner in the chemical conversion train and refer to the initial biofeedstock: air-dry cereal straw with m = 100% and e = 100%. This allows a convenient and quick overview on the mass and energy flows in the process. 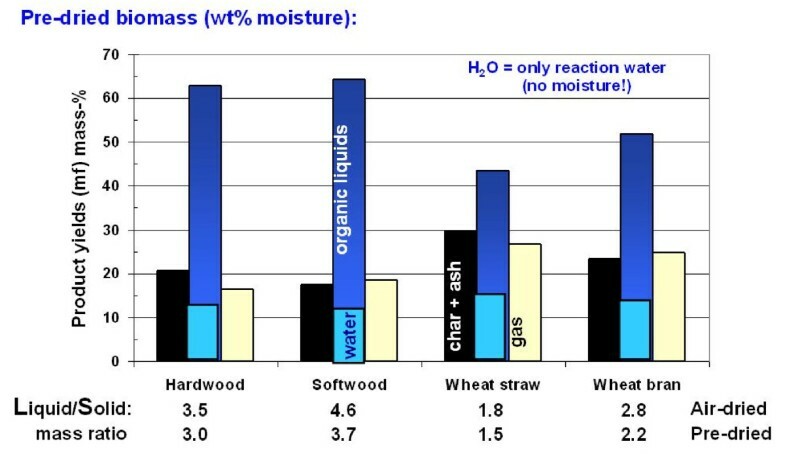 Successive mass streams are 7 t of air-dry straw (15 wt.% H2O, LHV 4 kWh/kg) → 6 t of dry straw → ca. 4.7 t of biosyncrude (slurry or paste LH ca. 5.4 kWh/kg) → 1.25 t of FT raw product (LHV ca. 12 kWh/kg) → 1 t of biosynfuel (LHV 12 kWh/kg). The standard reaction enthalpies are the sum over the combustion heats (HHV) of all individual reactants i:∑ΔcHi. Unknown combustion heats for organics have been estimated with fair ± 1.5% accuracy from their CHO (N, S, ash) composition with the Channiwala equation. Since this equation is linear in the elements, a zero ΔrH will result if the Channiwala relation is applied to all reactants. Typical outliers are the small molecules like the combustion products H2O and CO2 or pure carbon as shown in Table 4. Thus, an estimate of ΔrH is only possible if the yields of these small molecules are known or have been measured. The reaction enthalpy is then the sum over these yields times the ΔcH difference from the Channiwala equation and measured ΔcH data. For FP, the experimental sum of combustion heats of the products is usually found to be lower than that of the educts, indicating an exothermal reaction. However, since some volatile oxygenates with low molar mass escaped unobserved and unanalyzed with the pyrolysis gases - noticed not only in our experiments - this is a reasonable explanation for the deficit of several percent usually observed in the experimental mass and energy balances from biomass FP. The measured average heat requirements of ca. 1.3 MJ/kg for FP of dry lignocellulose [35, 66] are higher than the value of about 0.9 MJ/kg expected for heating-up the FP products from ambient to 500°C; this indicates a slightly endothermal FP with positive ΔrH. The lowest observed heat requirement of around 0.9 MJ/kg is comparable with the energy required to heat the pyrolysis products from ambient to 500°C. This is a hint that the FP reaction of lignocellulose is occasionally thermoneutral. In practice, ca. 10% of the initial bioenergy is required for FP without heat recovery during quench condensation and including some heat losses in the hot loop section. Not included is the energy for biomass diminution and electricity consumption, e.g., for cooling water and process pumps; this requires several percent more. Energy invested into FP is at least partly compensated by energy savings in downstream processing, e.g., by the significant mass reduction from 100 wt.% of biomass feed to about 80 wt.% bioslurry at a 20 wt.% pyrolysis gas yield. The energy flow diagram in Figure 27 shows that the chemical combustion energy ΔcH in the successive products decreases stepwise due to the liberation of energy as reaction heat: the higher the reaction temperature, the more valuable is this thermal reaction energy if conversion to mechanical or electric power is considered. Not more than about 40% to 50% of the initial bioenergy can be converted into a final biosynfuel, e.g., via the FT process. The conversion efficiency of biomass-to-synfuel depends much on by-product management. Recycle of unconverted syngas and by-products improves the product yields but is usually more expensive than the simpler direct combustion to generate energy, especially for a self-sustained process. A self-sustained process without import or export of energy is assumed to be near the economic design optimum. Energy flow in the successive steps of the bioliq process (based on Table 6). Manufacturing costs of biosynfuels are affected by some general plant characteristics. TCI for a ten times higher production rate increases then only by a factor of 5; in other words, a capacity increase by an order of magnitude reduces the specific TCI to about half. As a consequence, BTL plants or thermochemical biorefineries should be as large as reasonably possible. A modern oil refinery produces about 10 Mt/a of oil-derived motor fuels. The production capacity of a biosynfuel plant should be at least 1 Mt/a or 10% of an oil refinery for competition reasons. A reasonable size for the much smaller regional FP plants is a maximum delivery distance of ca. 30 km for the local farmers with their tractors. It is an accepted experience from the seasonal sugar beet transport that a faster transport with trucks reduces the local traffic holdup without much transport cost difference. A regional 100-MW(th) FP plant with ca. 200 kt of annual biomass throughput (25 t/h of air-dry lignocellulose with 15 wt.% H2O and LHV of 4 kW/kg in 8,000 h) requires about 13,000 truck transports/year with a 100-m3 volume and 15-t straw bale mass on the average of 30 km back and forth. Delivery during 3,000 h/a daylight without weekends and holidays requires at least a dozen of special trucks in permanent operation. Biomass transport costs. In central EU, about 1 Mt/a of residues from forestry and agriculture (half the cereal straw harvest) is available within a radius of about 70 km. Because of the tortuous roads, this transportation distance is also a reasonable estimate for the mean transport distance. Above about 70-km distance, direct truck delivery of air-dry straw to a central plant becomes more expensive than regional pyrolysis plants followed by biosyncrude or bioslurry transport in silo wagons with the electrified rail to a large central BTL plant. A BTL plant with 1-Mt/a biosynfuel capacity is a reasonable minimum size and needs ca. 7 Mt/a of air-dry wood or straw. The local traffic density for truck delivery to such a huge plant would be an unacceptable nuisance for the local population and requires additional money to extend and maintain the local road infrastructure. A 100-m3 truck load with 15 t of straw bales would result in a truck movement in and out every half minute without interruption for days, nights, and weekends. 'Brownfield' or 'grass root' plant site. A plant site within an already existing industrial complex (brownfield), e.g., an oil refinery or a chemical complex, enables remarkable cost savings since many auxiliary facilities are already available. In a grass root or 'greenfield' site, additional money is required for the erection of these facilities. Rail access is of special importance for a biorefinery because of the large delivery volumes. Cost reduction by learning. Capex and opex decrease with increasing practical experience. An exponential cost decrease is usually assumed for successive plants, down to a minimum of maybe only half of the TCI for the very first commercial plant. This will be a fast process for the large number of FP plants required; for the huge BTL complexes, a much slower stepwise decrease is expected. Experience from the operation of the technically similar CTL and GTL plants will contribute a lot to the learning process, especially in the tail-end section. Also, a common operation with different feed materials can be considered in huge XTL plants. The stepwise cost decrease with growing experience can be complemented by cost savings by simultaneous orders of equipment or by replication if several plants of the same design are erected in the so-called convoy mode. This also reduces engineering costs. Generalia (ca. 6% from 1 + 2 + 3 + 4 sum assumed). Capital and capital-related costs in this script do not refer to the very first commercial plant but to a brownfield plant with mature technology in more than a decade from now. Annual capital and related costs are assumed to be 25% of the TCI for a new plant. The GTL plant Oryx-1 in Qatar with a capacity of 35,000 bbl/day and a TCI of $1.1 billion, equivalent to about €1 billion at the report date, was the basis of the estimate. The scaled TCI of $0.75 billion for the slightly smaller bioliq BTL plant has been estimated without the costs for central biomass preparation by FP and without an air separation unit (ASU); FP and ASU together make up ca. 25% of TCI! The higher oxygen demand in a BTL plant compared to the gasification of coal or natural gas was considered by oxygen delivery over the fence as a raw material. 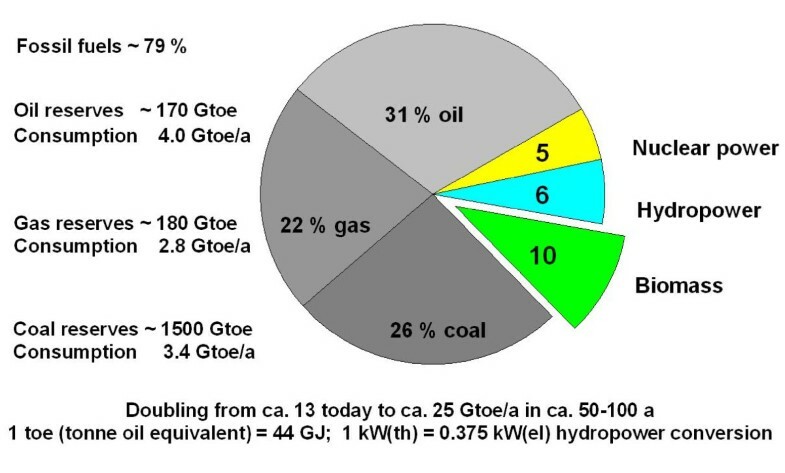 Figure 27 shows that a large bioenergy fraction of almost half becomes available for heat, high-pressure steam, or electricity generation. A self-sustained process including the large electricity consumption in the ASU and negligible additional utility costs have been assumed. The TCI of a single central bioliq BTL plant without FP preparation for 1 Mt/a of biosynfuel is comparable to the TCI for about 38 FP plants. Together, they add to a total investment of 0.75 + 0.76 G€ or about €1.5 billion (see Table 7). An economic assessment of different FP plants is discussed in the study of Peacocke et al. .
FP, fast pyrolysis; TCI, total capital investment; FT, Fischer-Tropsch; ASU, air separation unit; STP, standard temperature and pressure. Average personnel costs of 60 k€/person/year are a reasonable assumption for central EU. A price of about €60 to €70/t for residual air-dry (15 wt.% H2O) straw or wood delivered to the FP plant yard (free on board (f.o.b.)) is also reasonable . One should not forget that much of the biomass f.o.b. costs are labor costs or new jobs in agriculture. The individual cost contributions are summarized in Table 7 and visualized in Figure 28. The numbers in Table 7 can easily be adjusted to other conditions or replaced if better estimates or assumptions are available. Breakdown of the biosynfuel manufacturing costs for the Karlsruhe bioliq process. The total manufacturing costs for 1 t of biosyndiesel raw product with 6% generalia, but without biosynfuel distribution costs and profit, amount to ca. €1,090/t or (at a syndiesel density of 750 kg/m3) ca. €820/m3 with a large uncertainty on the order of ± 30%. This is about 1.5 times the known cost for untaxed, oil-derived diesel at an oil refinery gate and at the present crude oil price of ca. €80/bbl ($100/bbl) mid of 2011. The manufacturing cost breakdown for biosyndiesel in Figure 28 shows that the bio-feedstock plus transport causes about half of the costs. The other half consists of technical costs, which are about proportional to the specific TCI and decrease with plant capacity. In countries with low biomass costs, biosynfuel competition with oil-derived fuels will be attained much earlier. Labor costs do not play a decisive role in the large plants. Other methods for cost estimates give similar results  and remain within the given error range of ± 30%. Biomass is the only renewable carbon resource and will gradually become the major raw material for organic chemistry. Large physicochemical, biochemical, and thermochemical biorefineries are the organic chemical industries of the future and produce organic chemicals, biosynfuels, plus various forms of energy as inevitable couple and side products. The thermochemical pathway proceeds via the conversion of the abundant lignocellulosic biomass to syngas and allows a rather flexible use not only of various biofeedstock, but also of coal and other fossils during a transition period. The bioliq process under development at the KIT can be considered as the backbone of a large future thermochemical biorefinery. Lignocellulosic biomass is first liquefied by FP to a bioslurry. This is a convenient handling, storage, and transport form and has been successfully gasified in a slagging PEF gasifier to a tar-free, low-methane syngas. The front-end steps for syngas generation from biomass still need further development to achieve commercial maturity. The tail-end steps for syngas use are well known and practiced technically since almost a century. A vast literature exists for syngas generation and use. 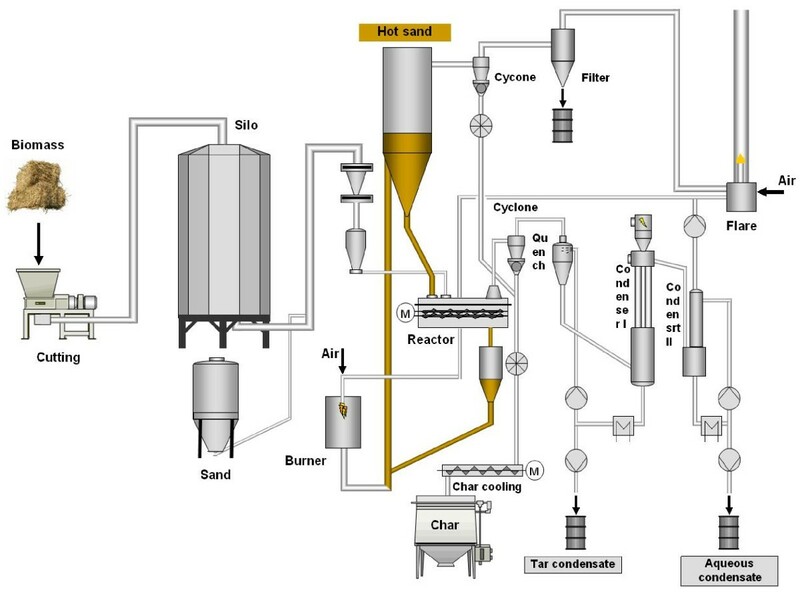 The feasibility of the essential new steps of biomass liquefaction, bioslurry preparation, and gasification in a PEF gasifier has been successfully verified in a number of lab- and pilot-scale experiments. We appreciate the substantial financial support from the German Ministry of Food, Agriculture and Consumer Protection, the Agency of Renewable Resources, the state of Baden-Württemberg, and the EU Commission for funding the RENEW and BioBOOST projects. FW as the chief engineer of the pyrolysis facilities at KIT carried out most of the experimental work on fast pyrolysis. EH along with ED worked out the bioliq concept; EH also performed the principles of process design and estimations. ND as the bioliq project manager added the relevant text and drafted the manuscript together with EH. All authors read and approved the final manuscript.